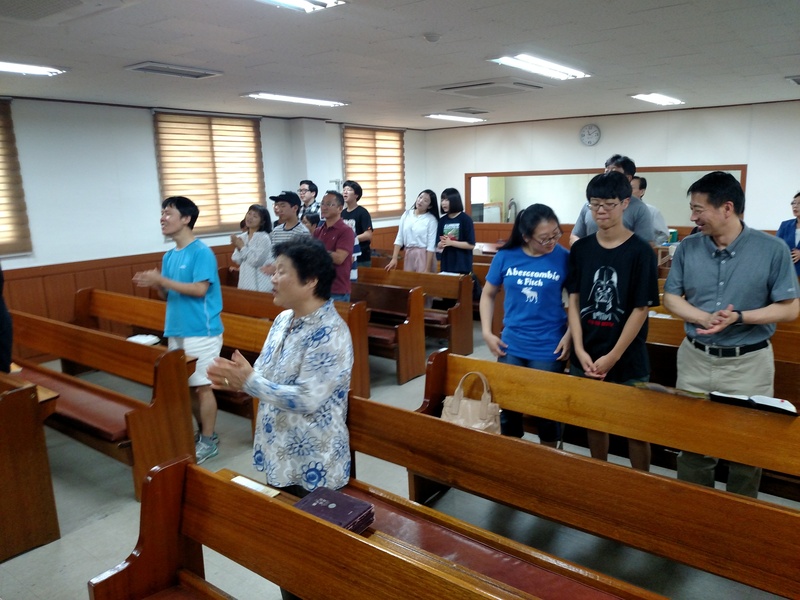 Since the service I was pastoring on post has ended due to the U.S. military moves to Camp Humphreys (more on the final service can be found here), I’ve been able to attend other worship services. 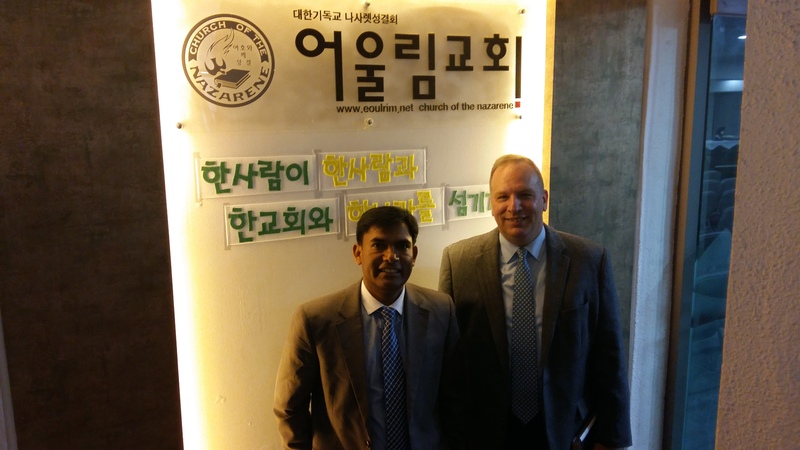 Last week I was at Tree Planted by the Water Church of the Nazarene north of Seoul. 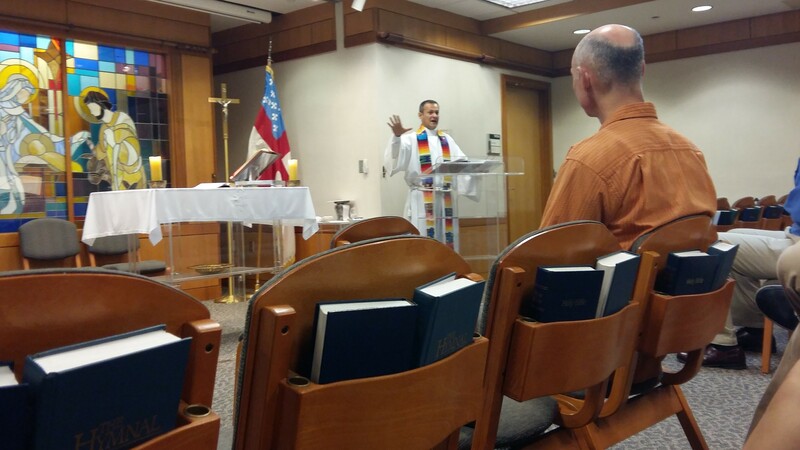 This week I attended two services: the “Traditional Protestant” service at the hospital chapel and the Episcopal service, also at the hospital chapel. 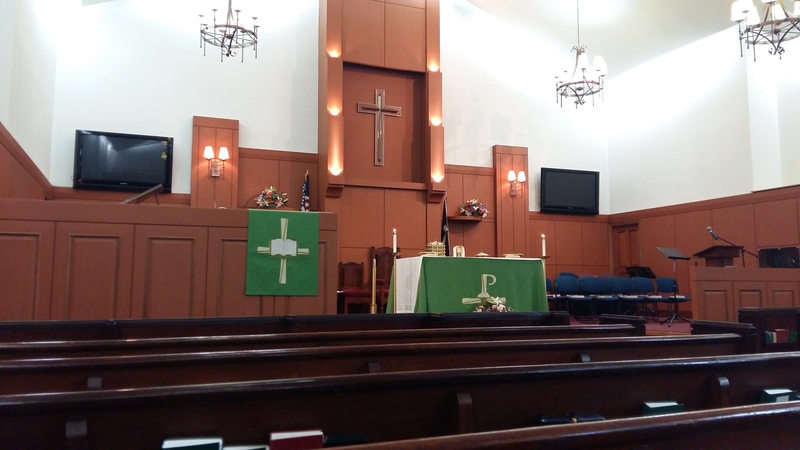 The Traditional Protestant service is the one most of the congregation from my service at Memorial Chapel chose to attend. There were 20 of them there today, that’s about half of my previous congregation and almost half of the attendance today. 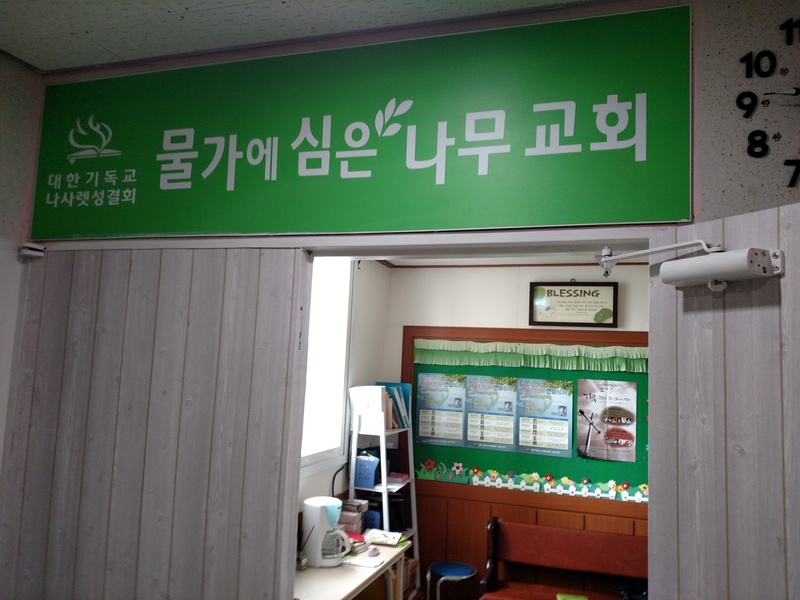 As I walked in, it felt like a reunion as many from my congregation greeted me as though it had been months or years since they last saw me, even though it had just been two weeks. It was a great feeling! The makeup of this congregation caused me to think about what has gone on in the United States over the past couple of weeks. 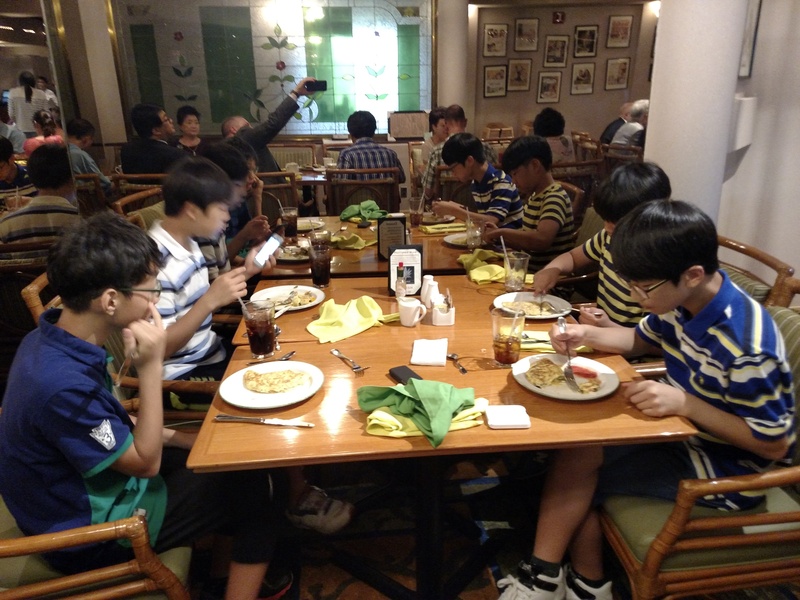 There was an almost even mixture of white Americans, black Americans, Korean Americans and Korean nationals. 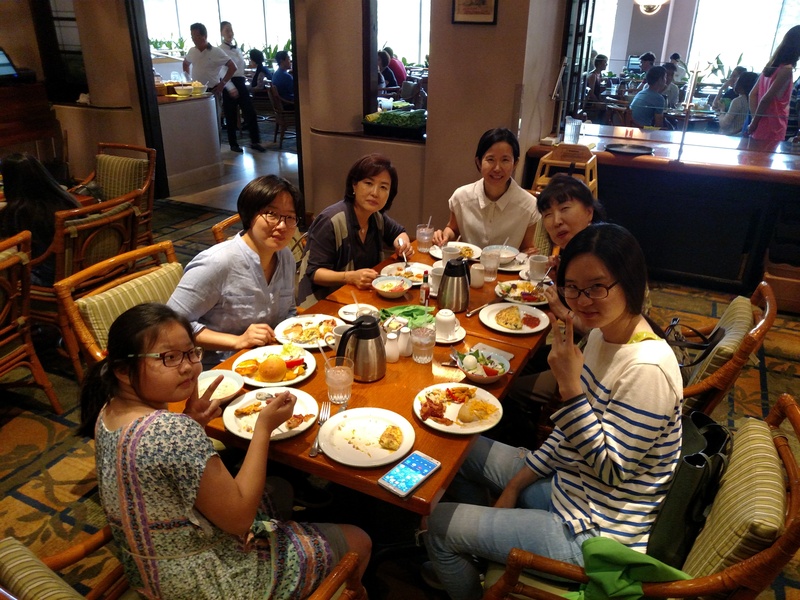 It was not a surprise that everyone got along -contrary to what you see on T.V.- since we’re all part of the family of God. 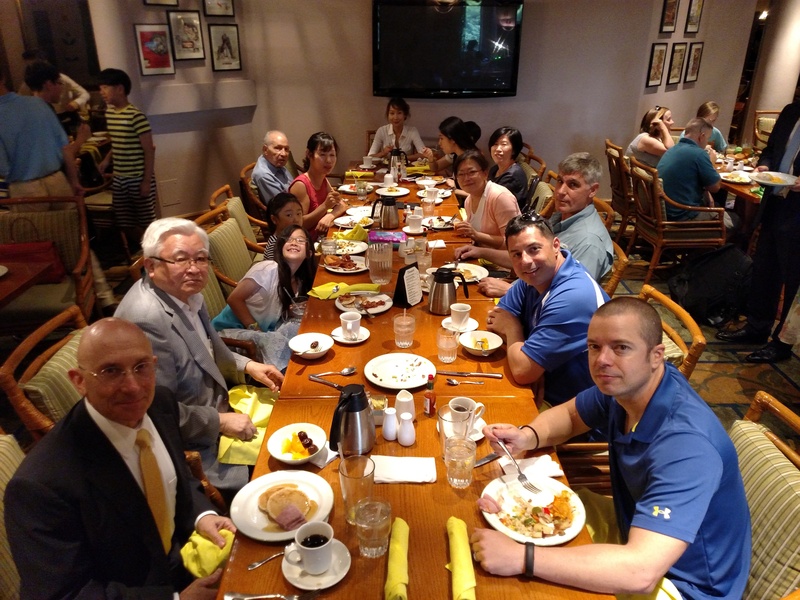 The time of worship and fellowship was reminiscent of a family gathering of siblings and cousins. We’re not all the same, but we have a common purpose: to love, serve and worship God, our common creator and Savior. 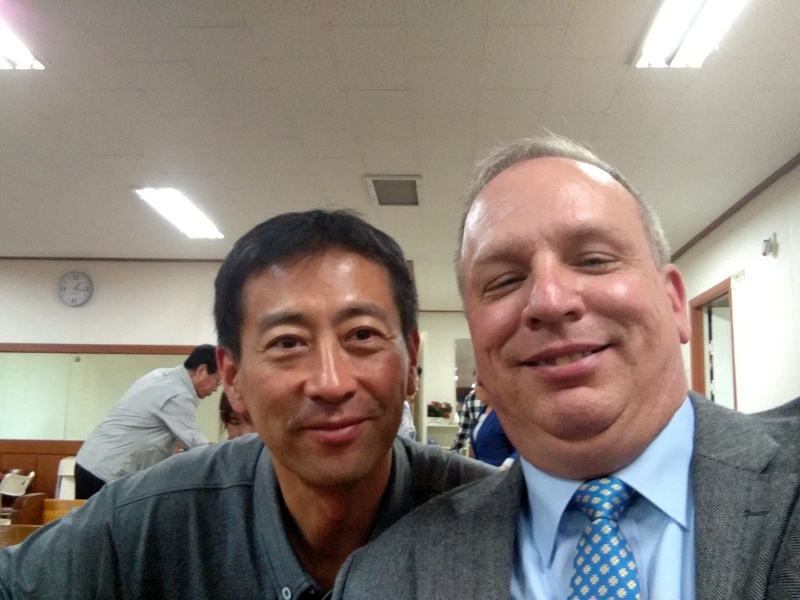 As it turned out, the pastor of the congregation was away, so there was a visiting chaplain there (Chaplain Yoo, the 65th Medical Brigade Chaplain). 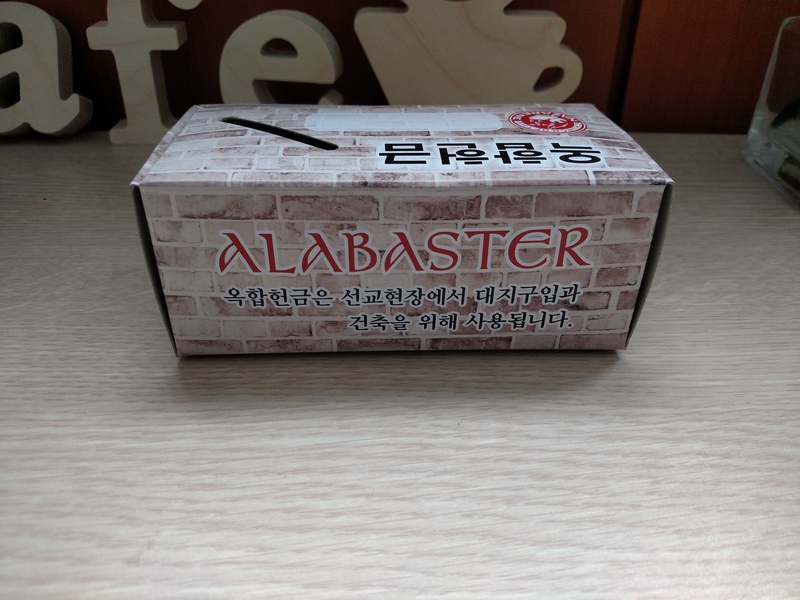 He shared a message from Jabez’s prayer about praying boldly and earnestly to our God who loves and cares for us. 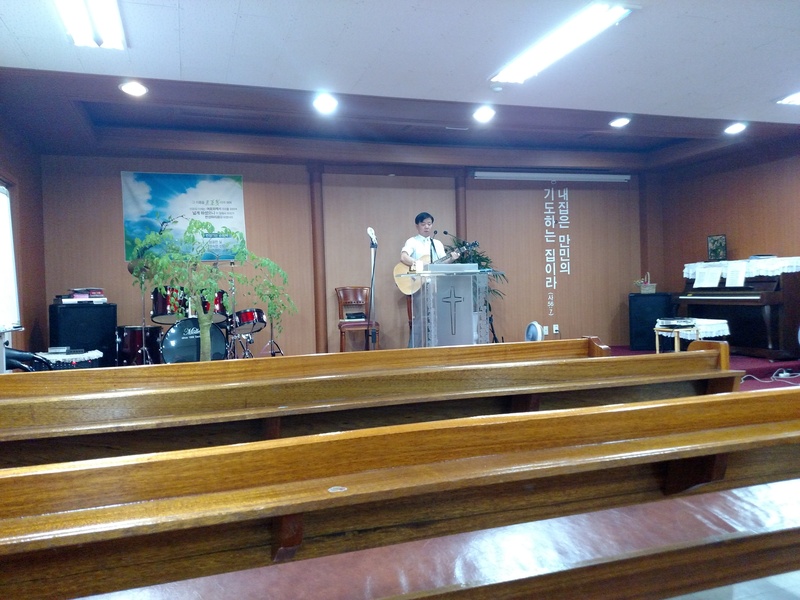 He also sang a song as part of his sermon-a tool I’m not gifted to be able to do! 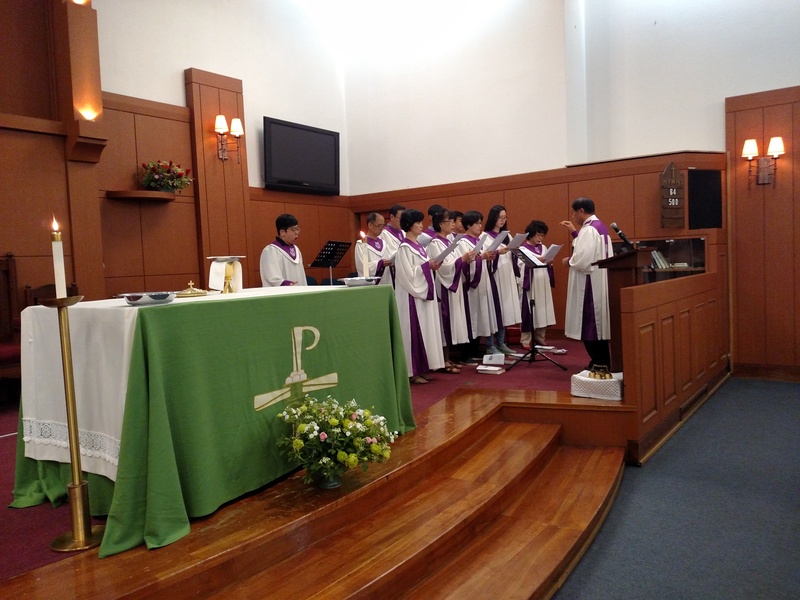 The rest of the service was a customary traditional service with hymns, prayer and an offering. 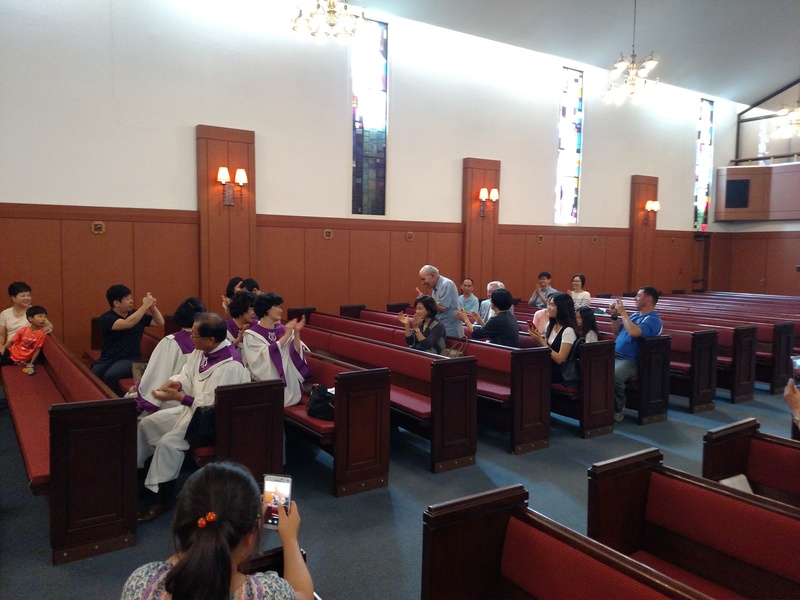 Communion is just celebrated twice a month in this congregation, which will take some getting use for my congregation since we were accustomed to celebrating it every Sunday. It was, however, a good service, with familiar elements making the presence of God felt and acknowledged. 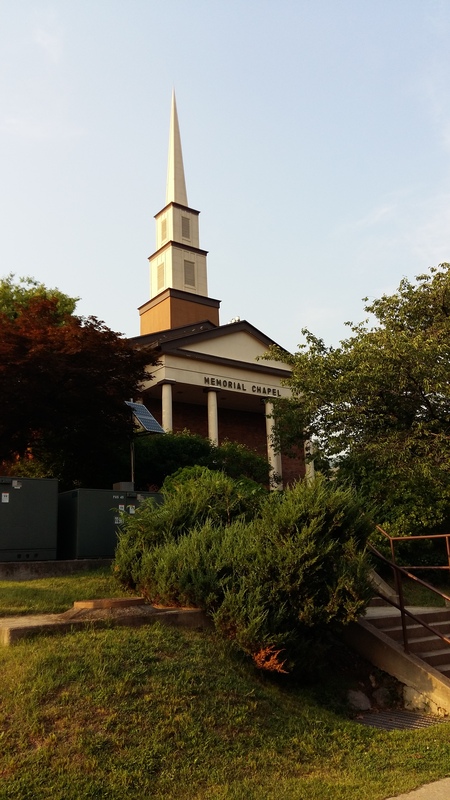 Even when I was pastoring the Liturgical Service at Memorial Chapel, when I got away in time I would often attend the Episcopal service at the hospital chapel. 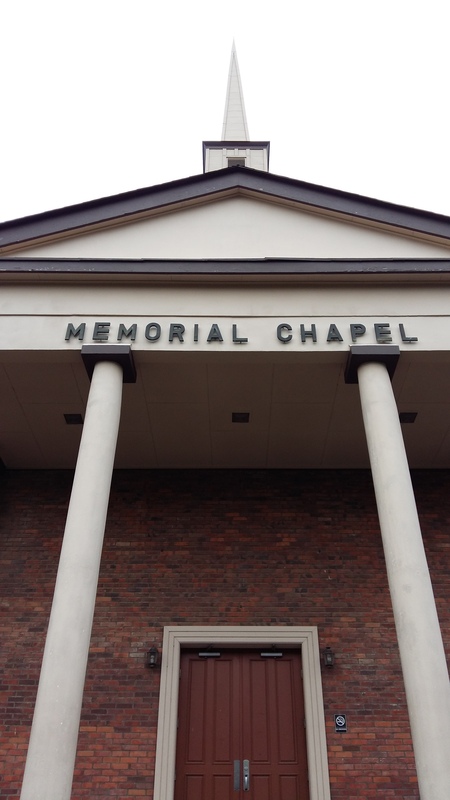 I have filled in and preached there before, as has the Episcopal chaplain for my service. I enjoy the liturgy and sacramental emphasis of the service and always leave spiritually nourished. 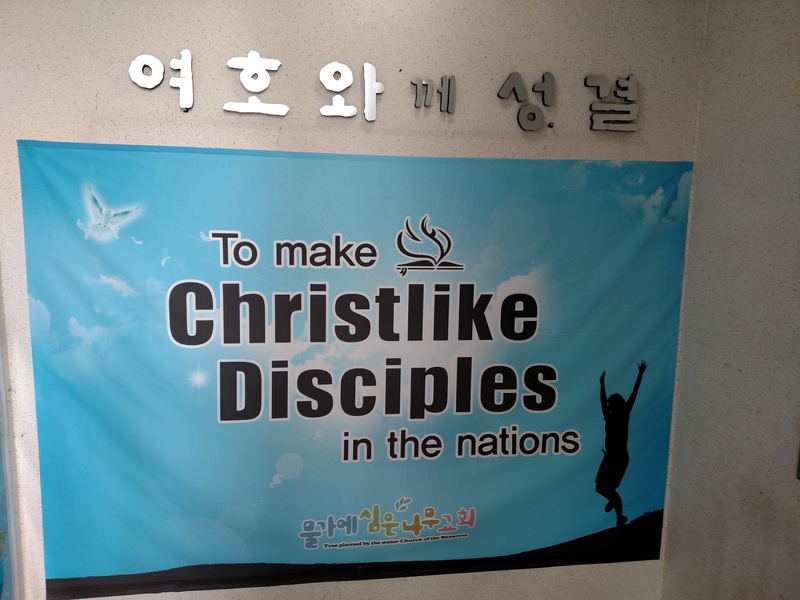 Not being sure if I would be able to attend next week (my last Sunday in Korea) I stayed to attend it after the Traditional Protestant service. 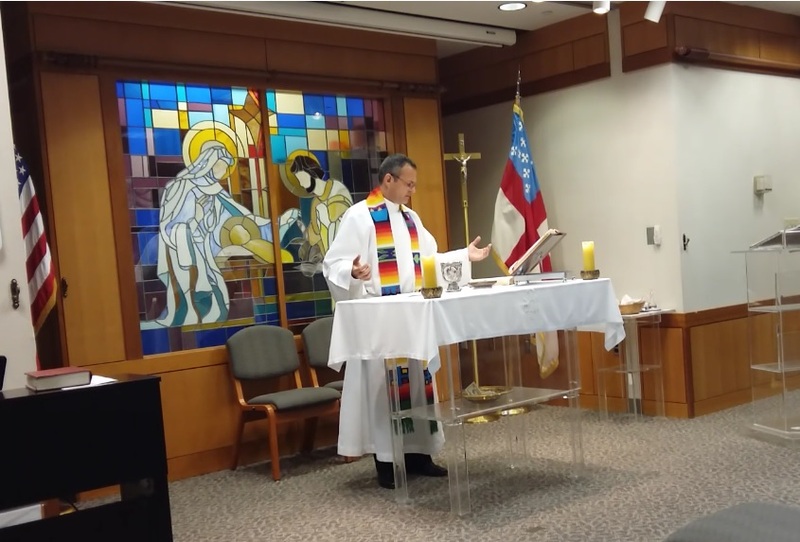 The chaplain preached from the Gospel Lectionary lesson for this Sunday, the parable of the Good Samaritan, tying in the tragic events of the last couple of weeks in the U.S. 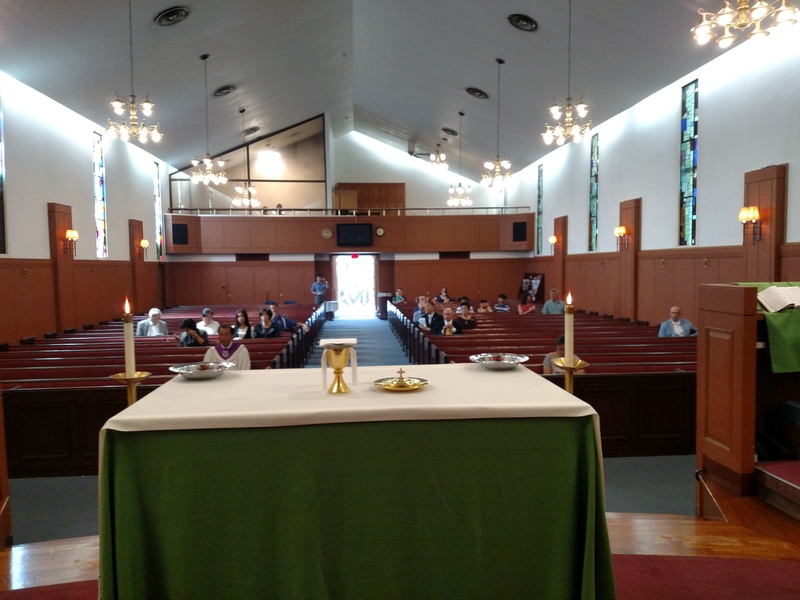 This service, being a “flagged” Episcopal service, followed the Book of Common Prayer (BCP) so included all of the elements normally part of a liturgical or sacramental service, including the celebration of communion. The Episcopal service has a small choir of 3 which, along with the organist, greatly contributes to the service. 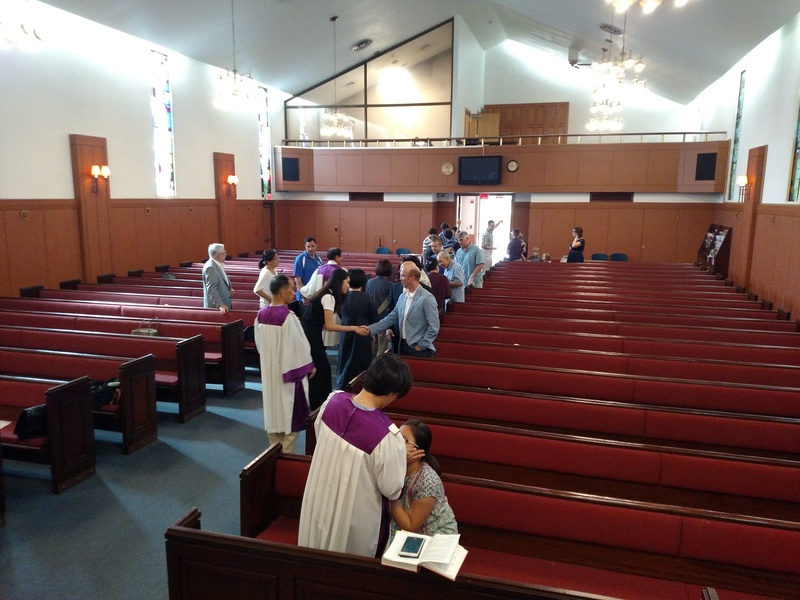 Members of the congregation participate not only in the responsive readings and prayers, but also as Scripture readers and prayer leaders. 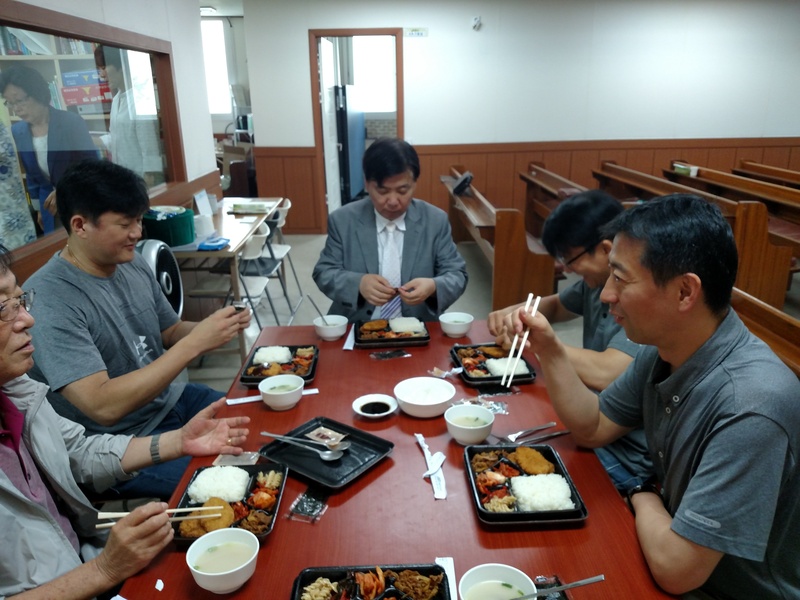 Since it is a specific denominational service, it is smaller, but the size also lends itself to a family feel with a strong sense of community. 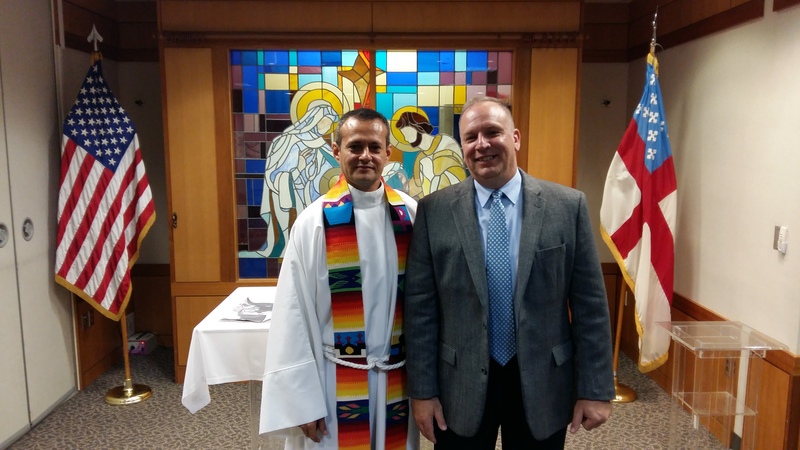 Me and Chaplain Budez, the Episcopal chaplain and friend. I always enjoy the service when I attend and today was no exception. 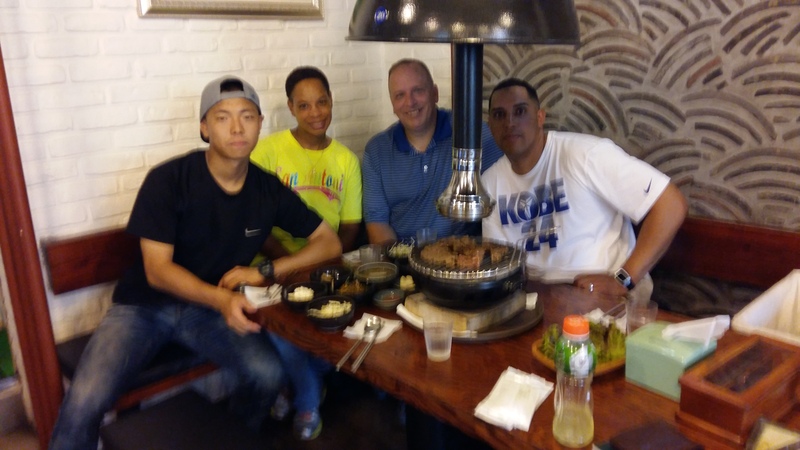 I’ve appreciated the ministry and friendship of Chaplain Budez as we have shared a common liturgy in our worship services and a strong desire for a “sacramental” worship service in the Yongsan community. 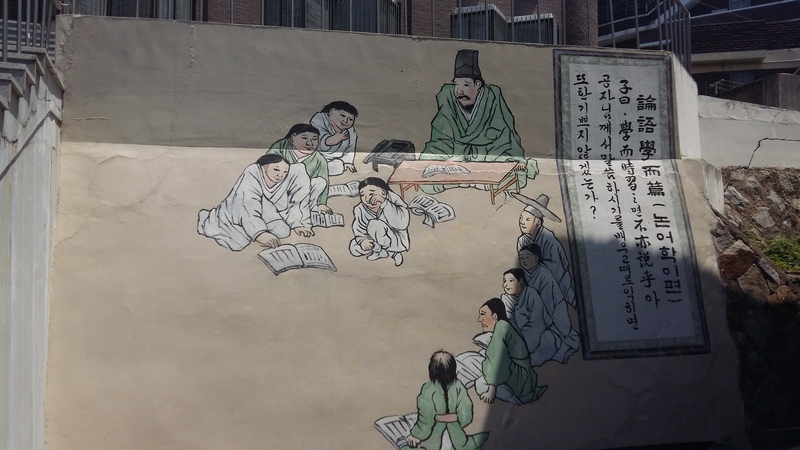 I stumbled across it on one of our trips when I walked a different direction, trying to explore other areas of Suwon. 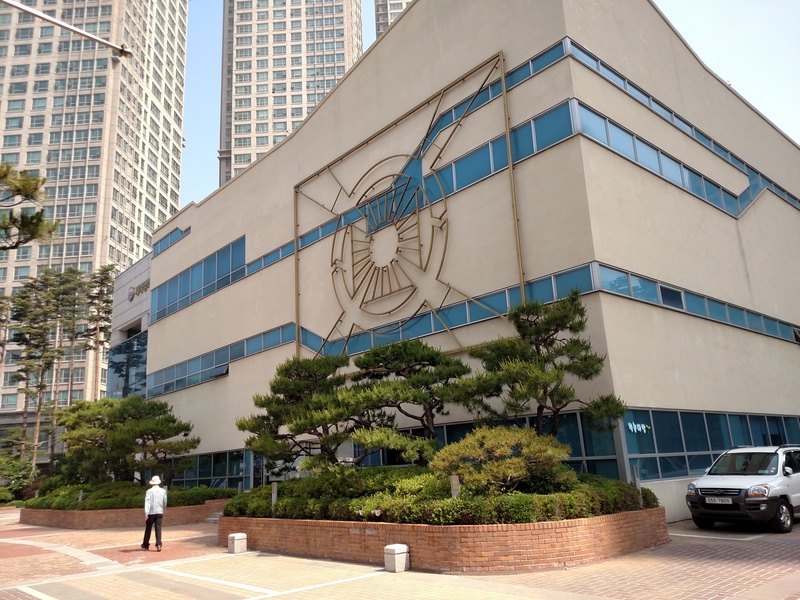 I wasn’t able to go into any of the buildings the day I was there, but took several pictures of the buildings and art. 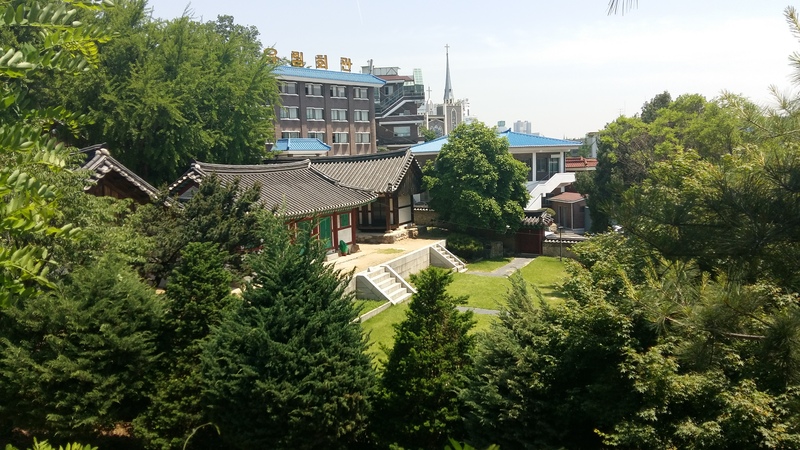 “The Suwon Hyanggyo, one of the national educational institutions of the Joseon Dynasty period, originally located at Bongdam-myun, Hwaseong-si, moved to Paldal mountain in 1789 (Jeongjo 13). 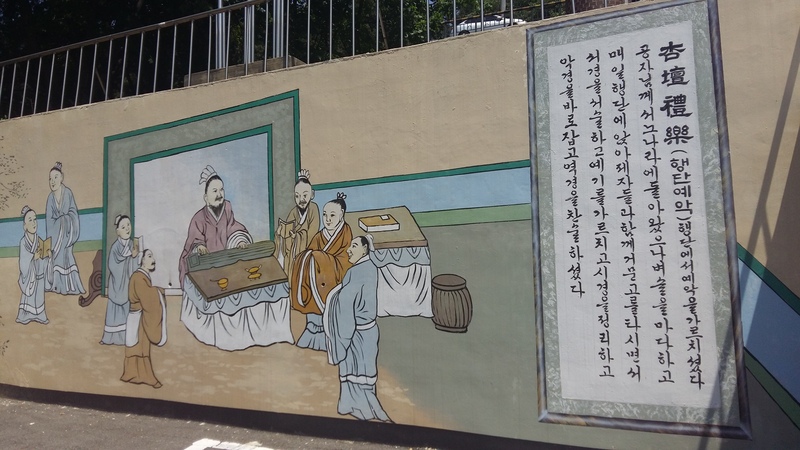 Hamabi and Hongsalmun displays its authority and building arrangements follow Junhakhumyo conventions (Myungryundang: frong, Daesungjeon: back). 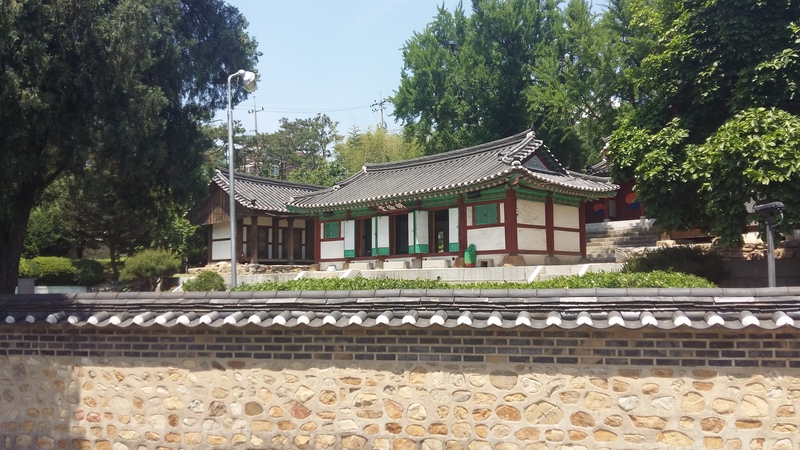 Masonries made of rectangular stones level up the floor height from the wuesammun to the Daesungjeon (Ikgonggae building with ornamented double-eave-gable-roof). Beside the compound is the memorial of some kind. 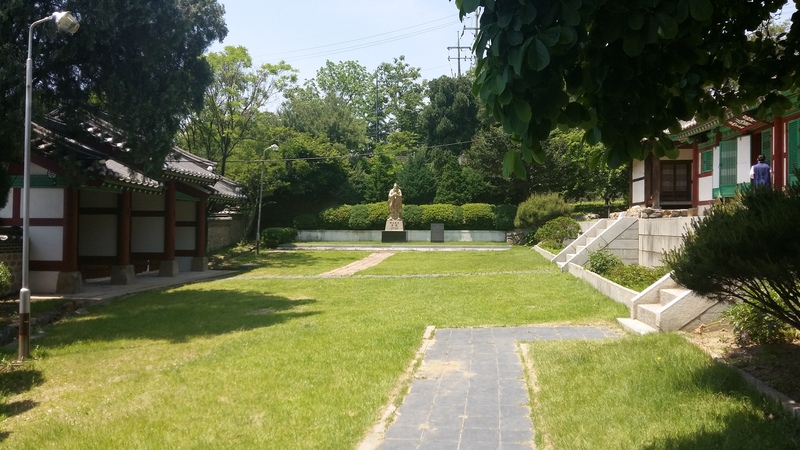 More buildings on the compound, with a statue of Confucius at one end. 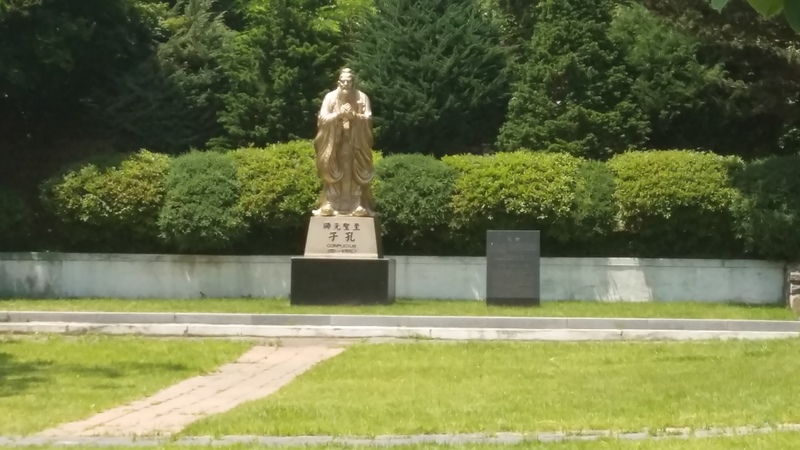 A closer view of the statue of Confucius. A building above the traditional part of the compound which I think is part of it. 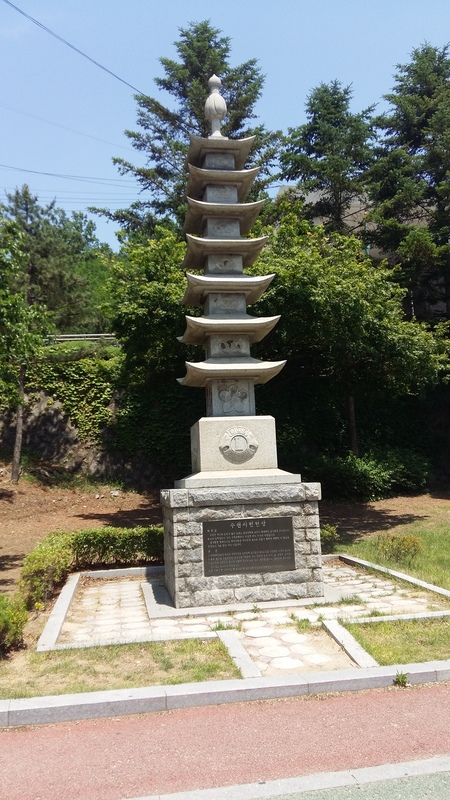 A pagoda beside the above building. 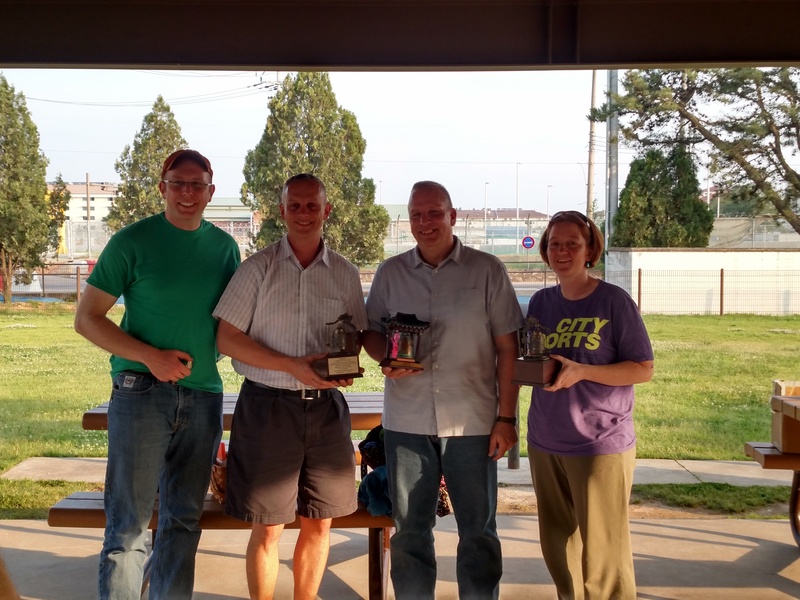 It looks like it was sponsored by the Lion’s Club. 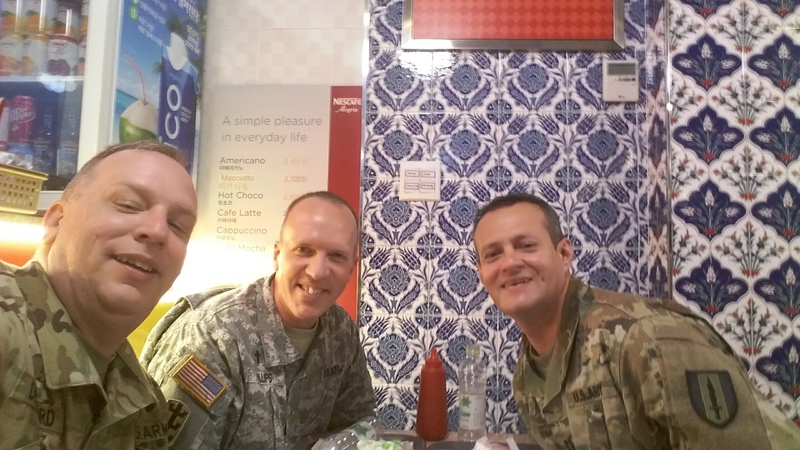 Wherever a chaplain is assigned, in addition to his/her assigned duties, they are expected to also be involved in religious support to the garrison where they’re located. 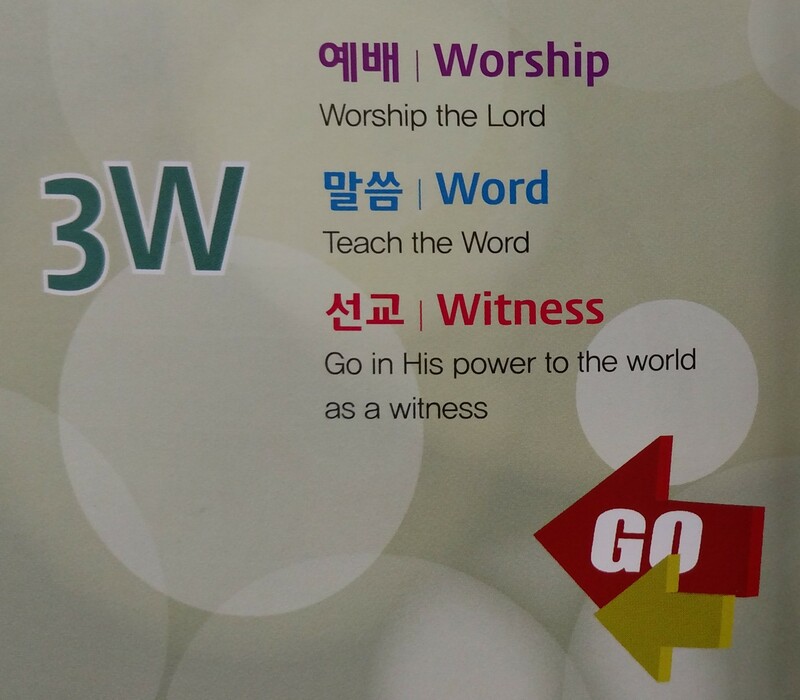 Often this means being part of one of the on-post worship services. 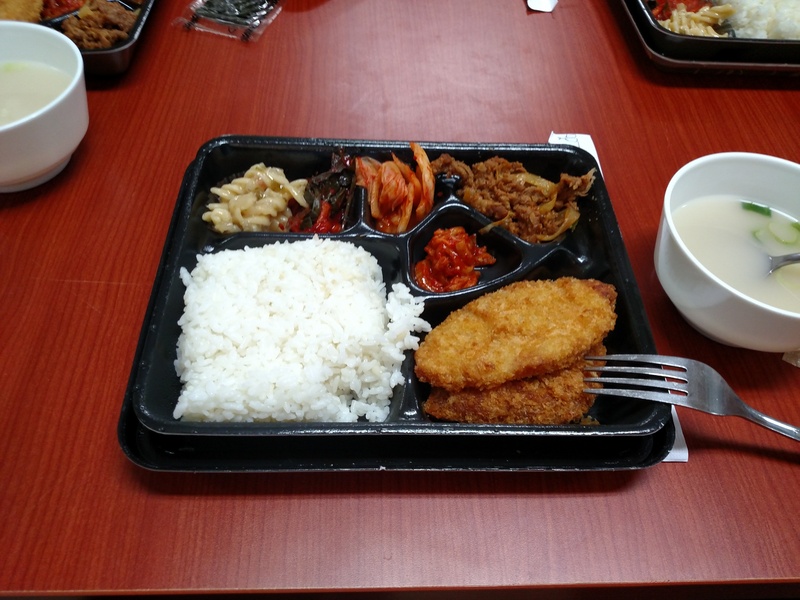 This has been the case for me while in Yongsan, South Korea. 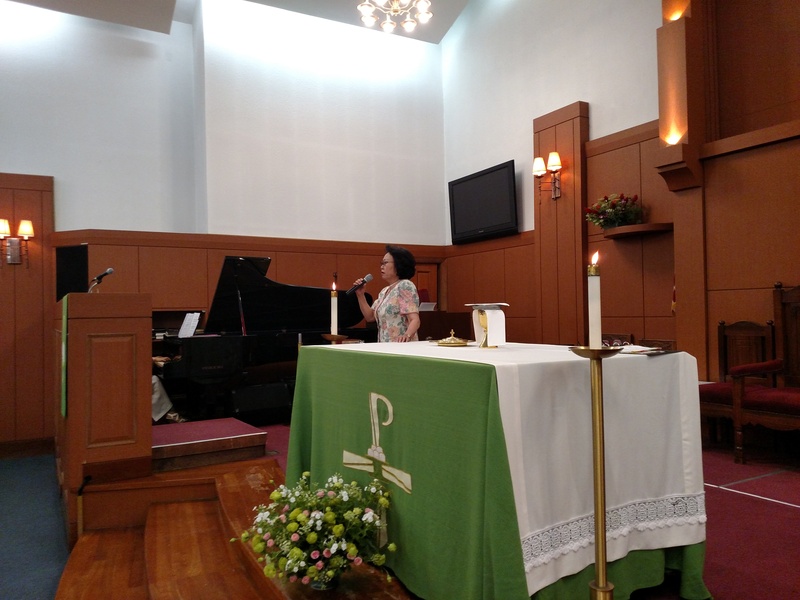 I have been the pastor of the Traditional Protestant Congregation who worshiped at Memorial Chapel on Main Post, for the year that I’ve been in Korea. 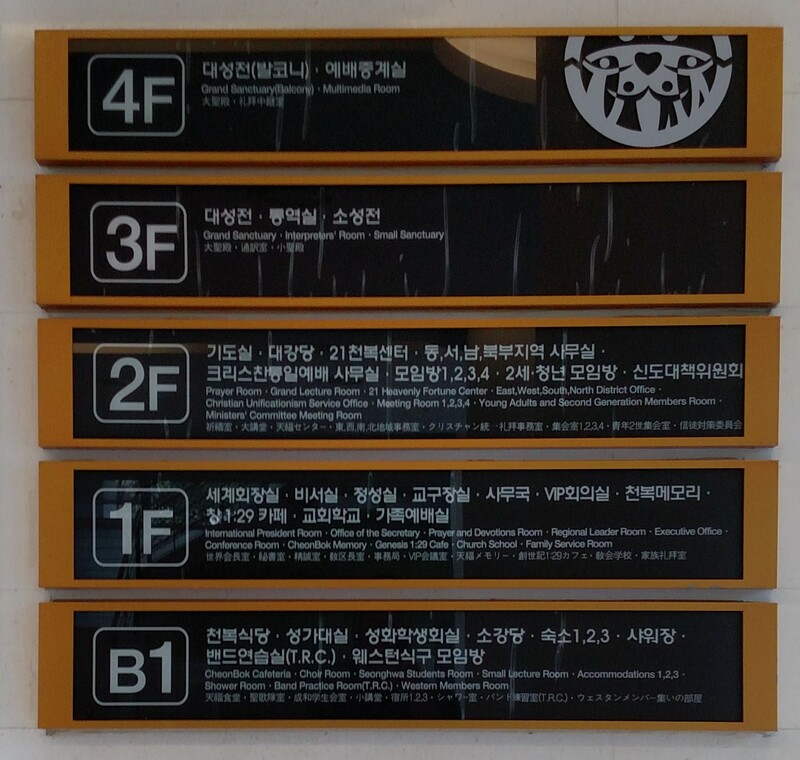 I’ve mentioned before about the movement of U.S. forces from all over Korea to USAG Humphreys near Pyeongtek. 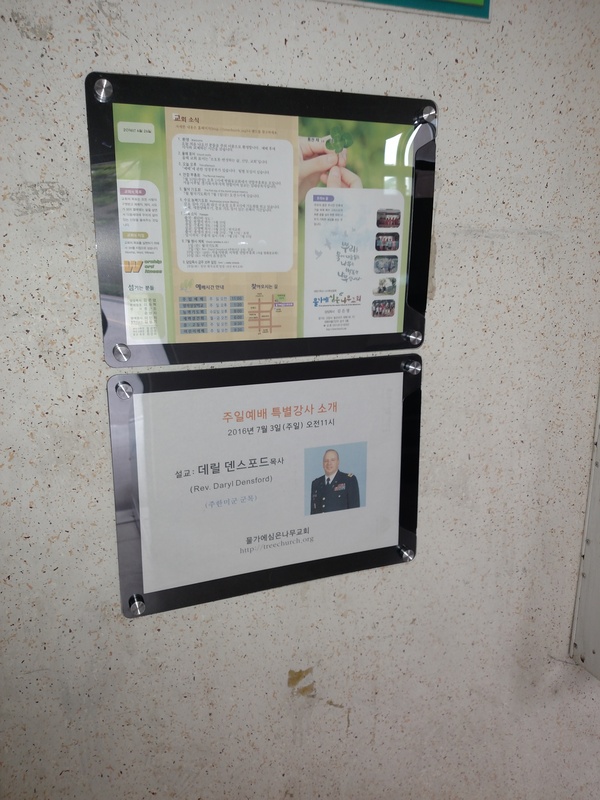 This is beginning to impact religious support at USGA Yongsan as there are fewer chaplains to support the multiple worship services. 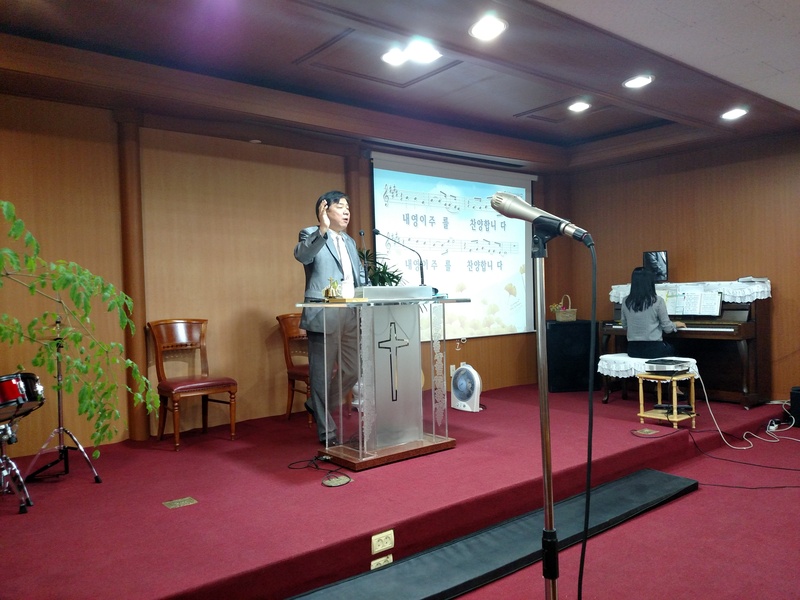 Today (26 June 2016), this impact became real for the congregation I have been pastoring as we celebrated the final service of this congregation which has been active in Yongsan for over 25 years. 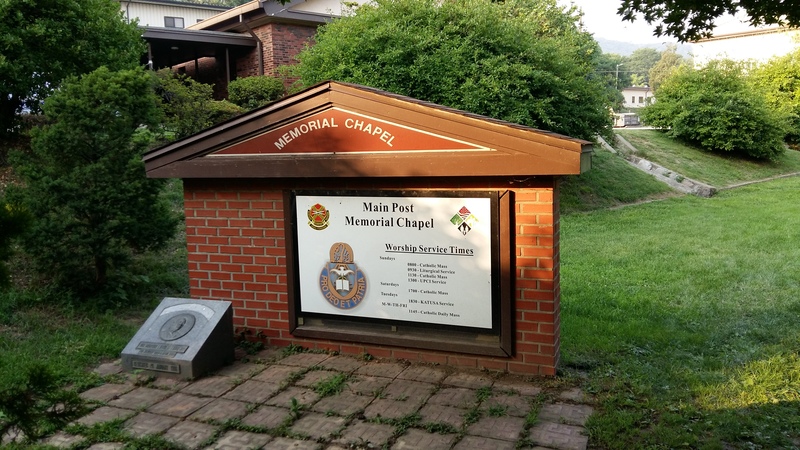 Beginning next week, the attendees will begin attending one of the other remaining services on post. 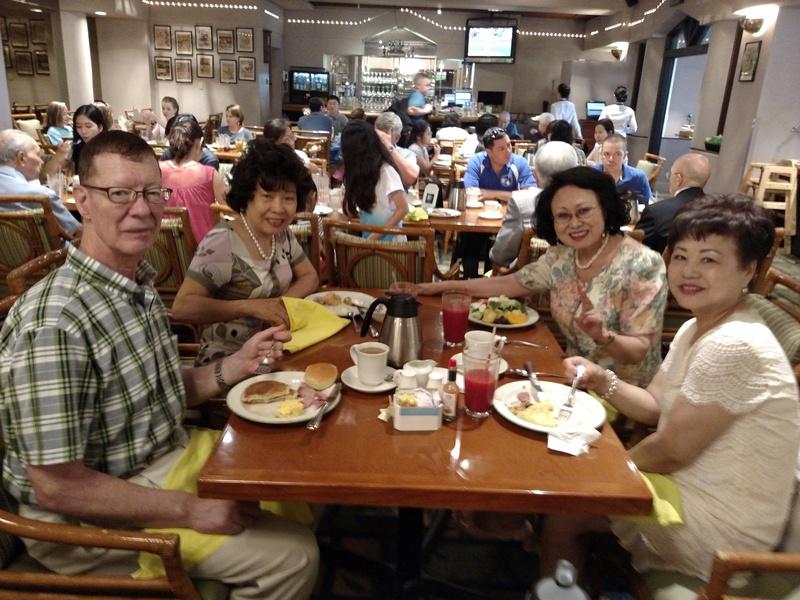 Here are a few pictures of the final service and the fellowship brunch we enjoyed together at Greenstreet at Dragon Hill Lodge following the service. 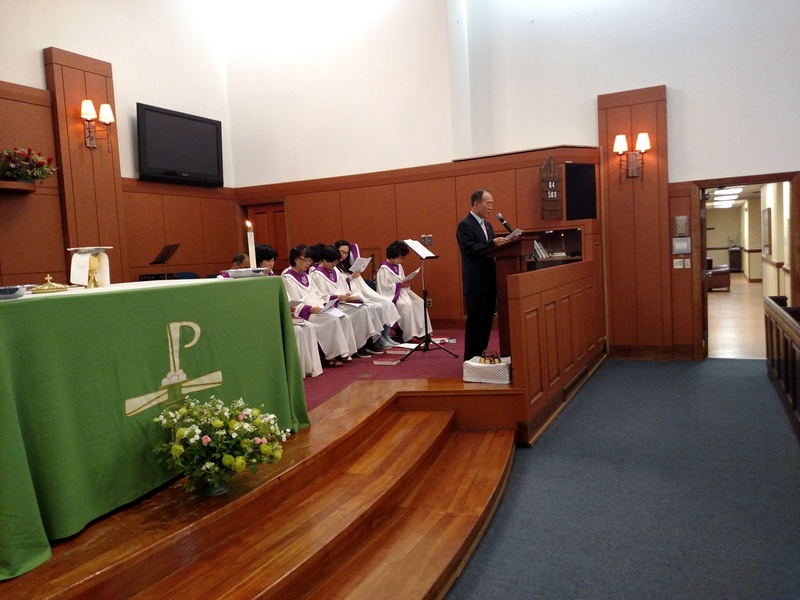 Richard always opens our service with announcements and birthday/anniversary greetings. The Scripture being read by one of the congregation members who has attended for 15 years. The choir is unbelievable. The choir director is a paid contractor who studied in the U.S. 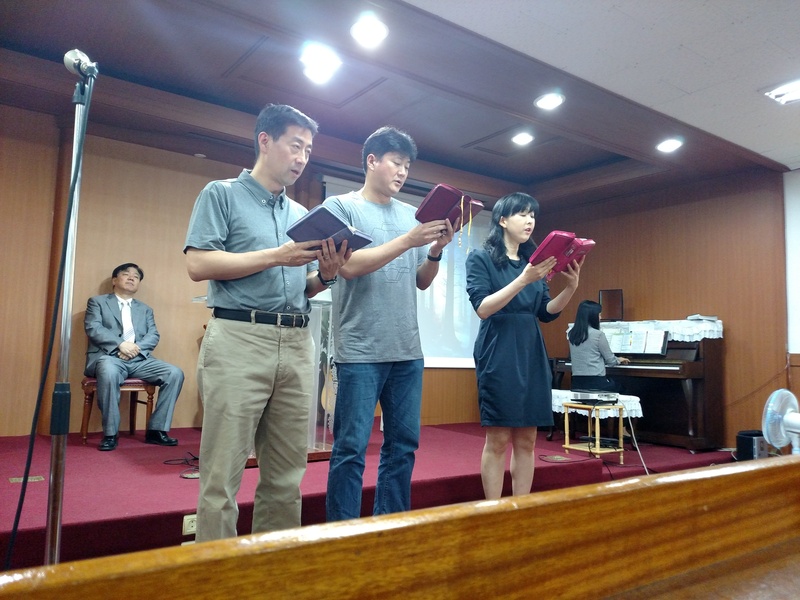 Many choir members come just to work with him. Dr. Rev. 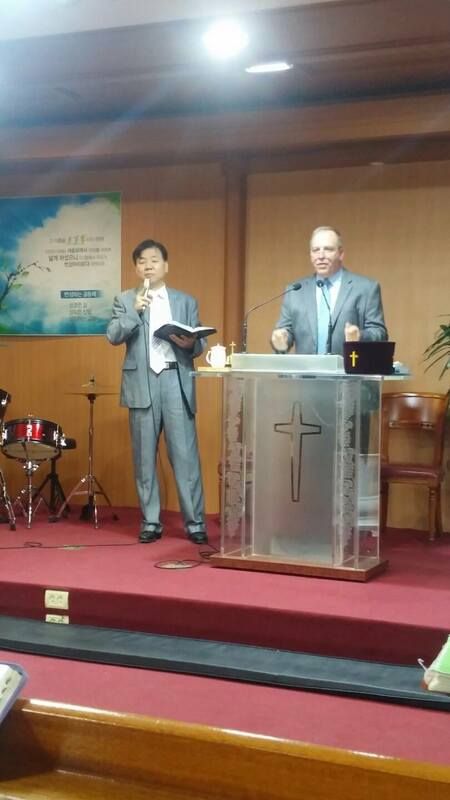 Lee studied in the U.S. and has been singing for the congregation for 10 years. Our musician (at the piano) is also a paid contractor. 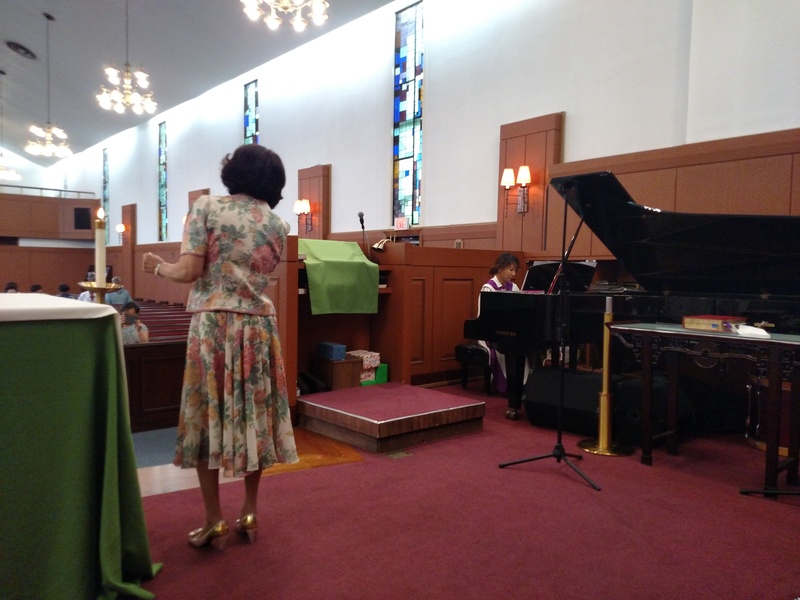 She’s great on both the piano and the organ. 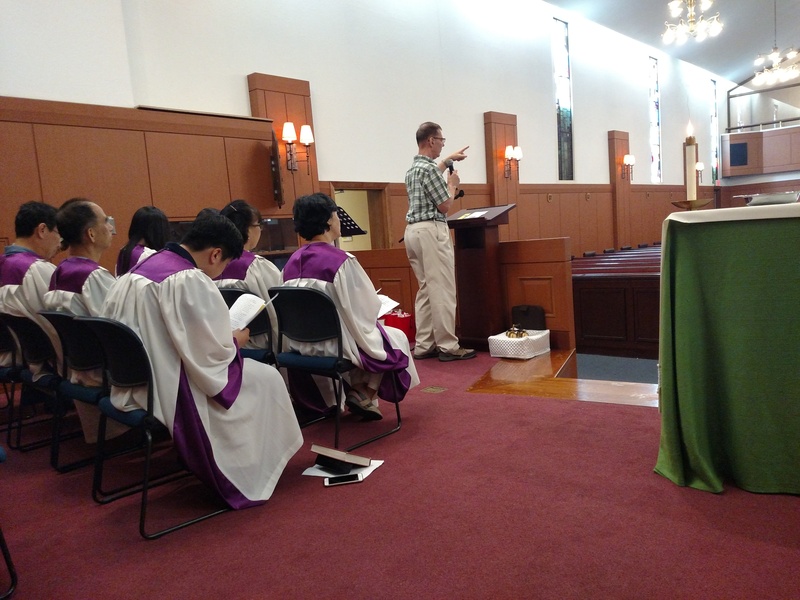 On this last Sunday, we celebrated Communion by Intinction. 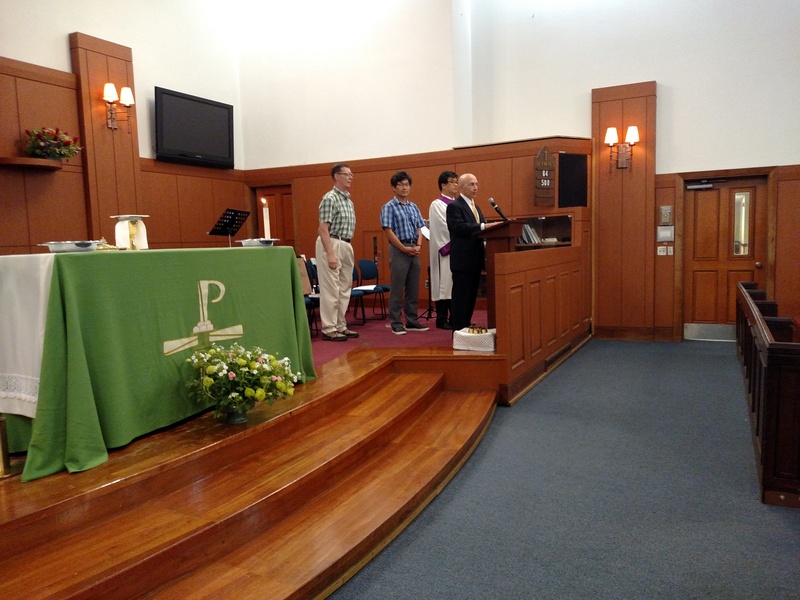 The Parish Advisory Council (PAC) gave a gift to some of the congregation who volunteered in different capacities. 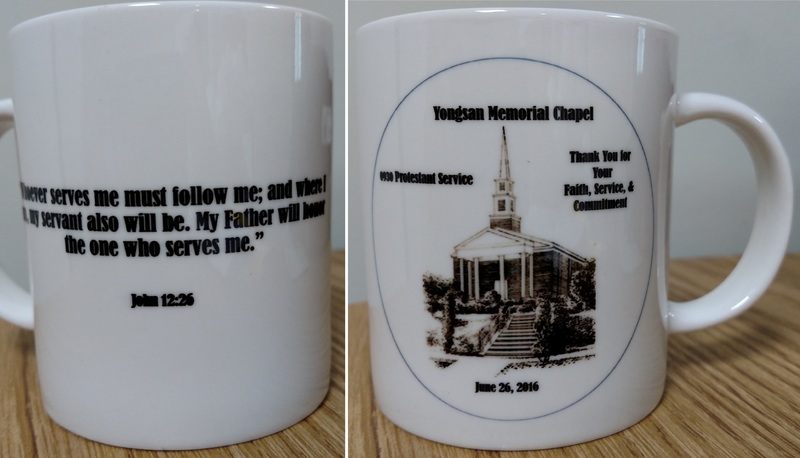 The mug the PAC gave chapel volunteers (and me). 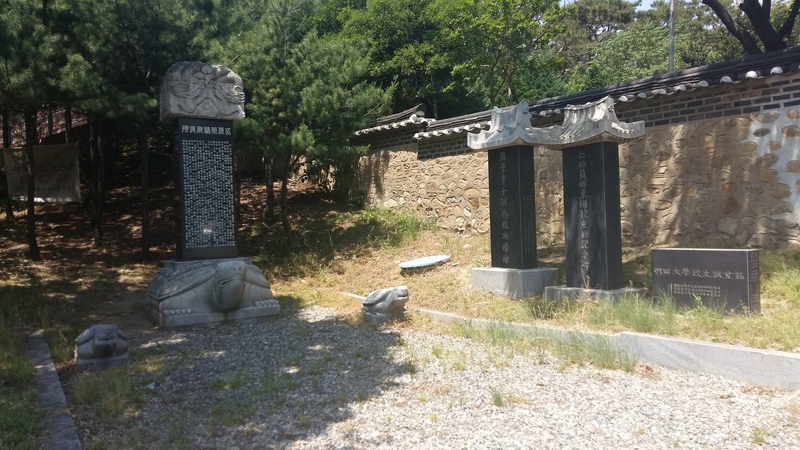 Angel first came to Korea to fight in the Korean War. 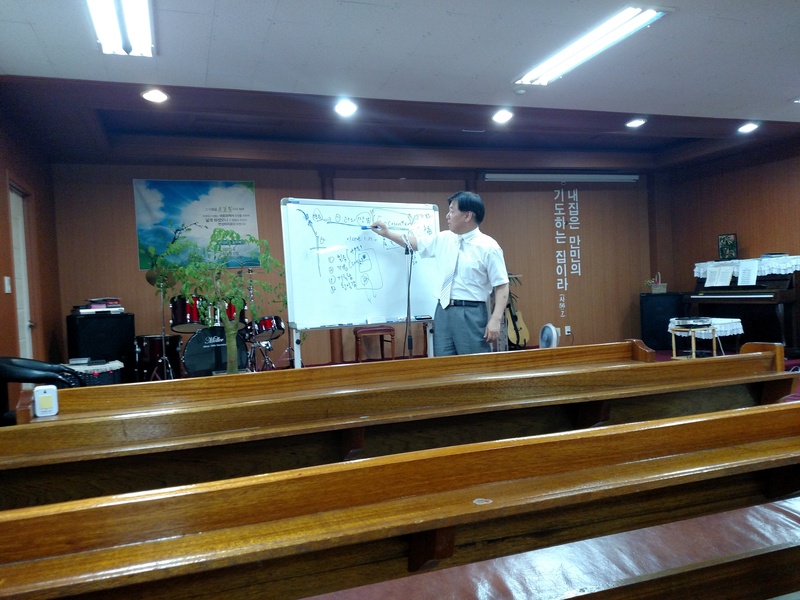 Since he’s been back (near the beginning of the congregation over 25 years ago) he has been serving the congregation in many ways. 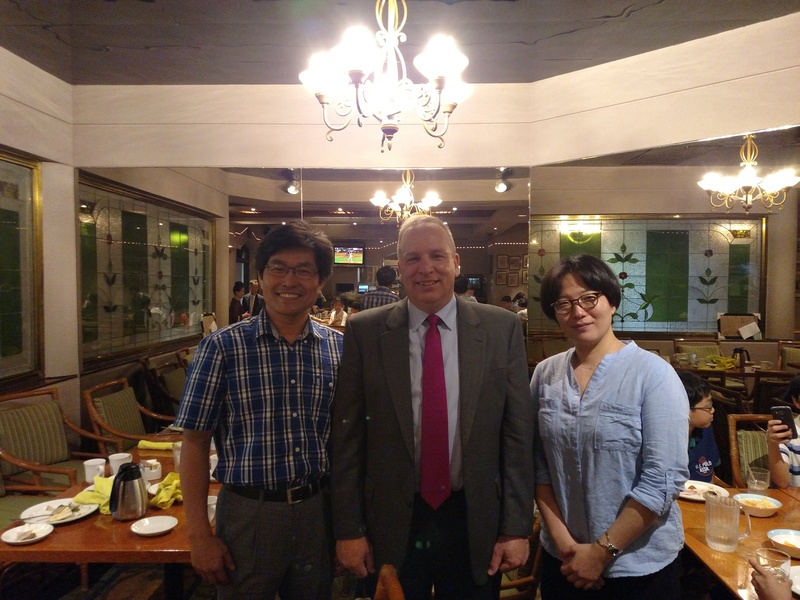 This couple has been part of the congregation for about 15 years. They’re there nearly every Sunday! This couple has attended for about 10 years. The man was also a regular usher. 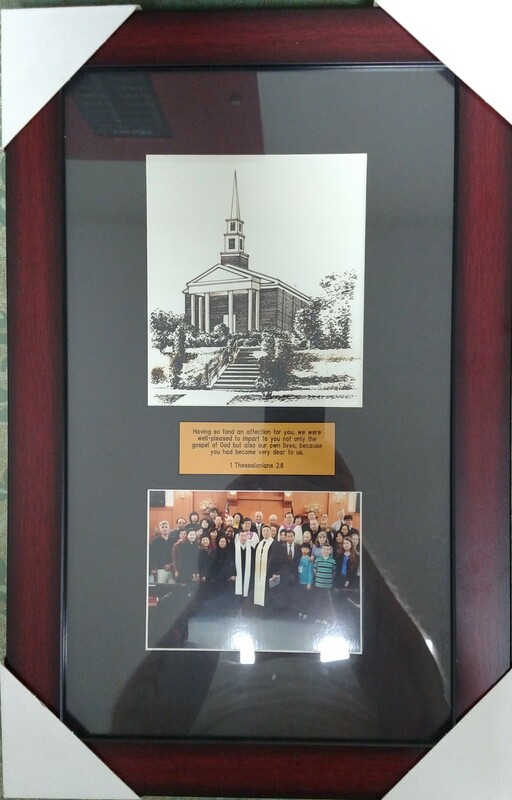 The congregation gave me this plaque in appreciation for leading the congregation for the past year (I’ll replace the picture of the congregation with the one we took today). I had these bookmarks made for everyone in attendance at our final service. 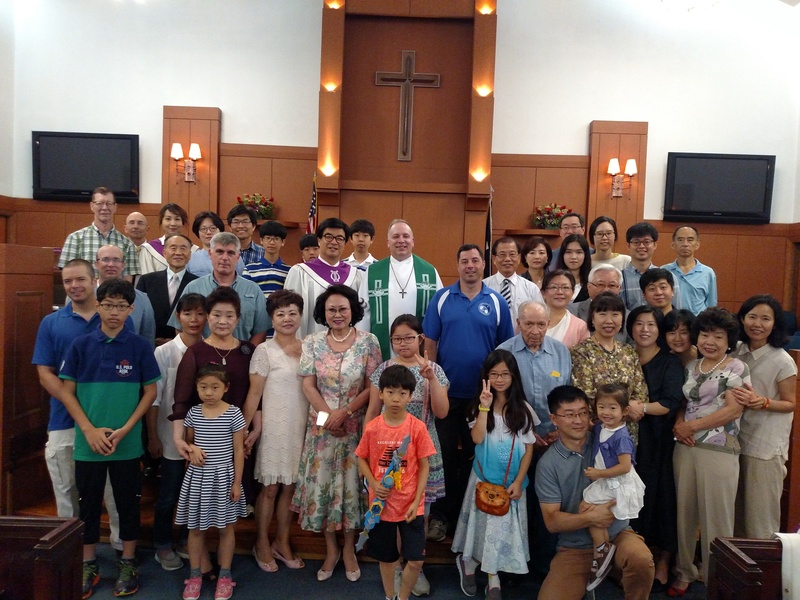 I was surprised at how much the congregation touched me in just a year. 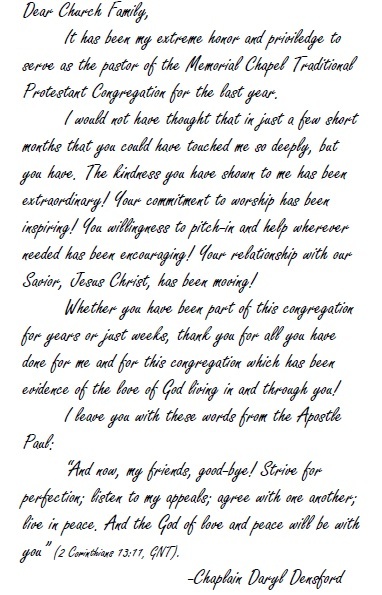 Here’s the “farewell” letter I put in the bulletin. 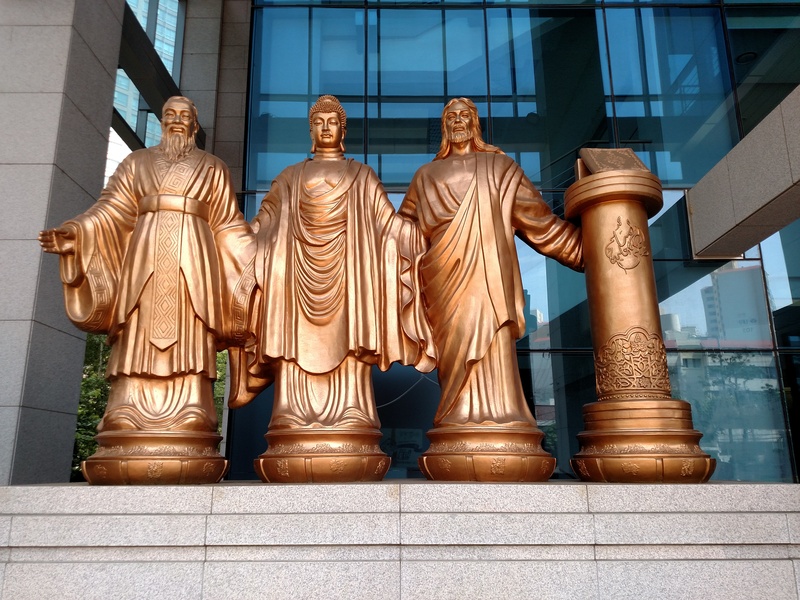 From left to right: Confucius, Buddha, Jesus and the Koran. Out walking the other day, I passed a curious statute that I had to return to with my camera. 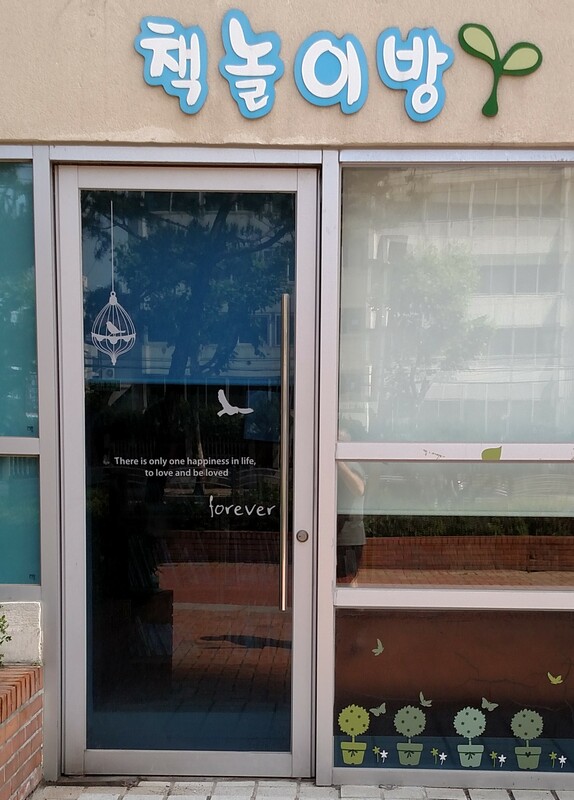 What it turned out to be was part of the Family Federation for World Peace and Unification, better known as its name prior to 1994 when Rev. 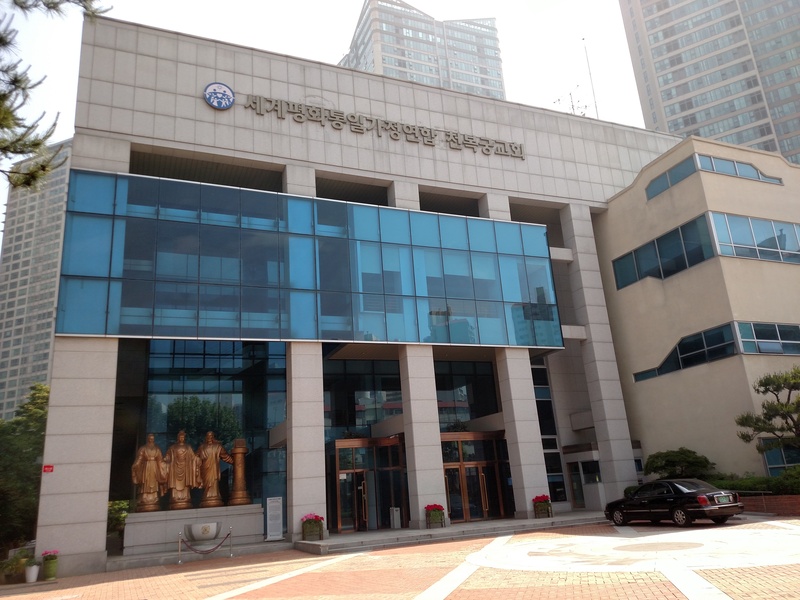 Sun Myung Moon consolidated his several organizations, Holy Spirit Association for the Unification of World Christianity or the Unification Church. Many non-Unificationists (as they prefer to be called) may know them best as “Moonies” though this is viewed as a derogatory term by adherents. The founder, Rev. 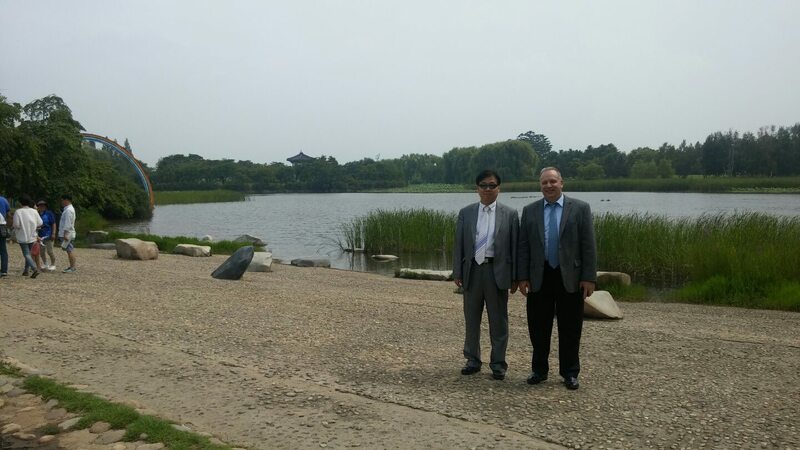 Sun Myung Moon was born in 1920 in what is now North Korea. Moon was raised a Presybeterian, but according to Moon, on Easter when he was 15, Jesus appeared to him commissioning him to complete the work that Jesus had started. 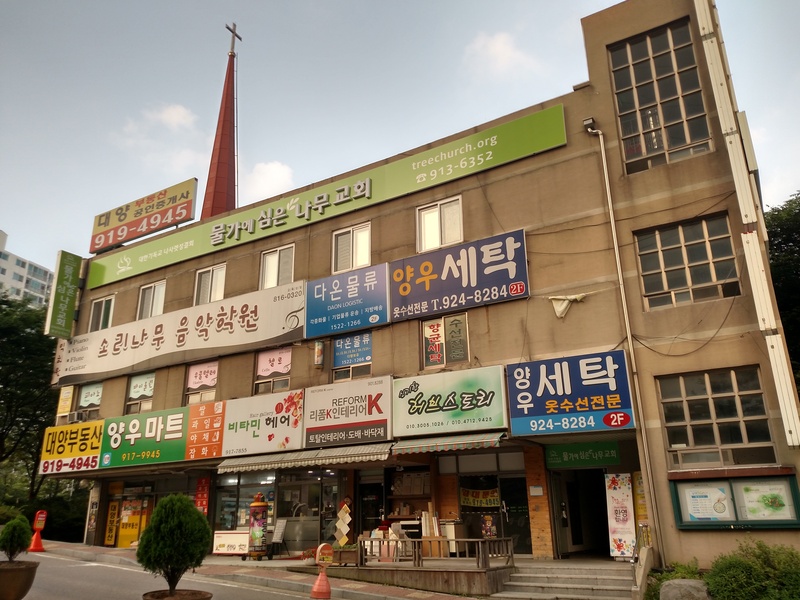 In the 1950s, after being excommunicated from the Presbetyerian Church for his unorthodox beliefs, Moon founded his church which today boasts several hundred thousand adherents around the world. 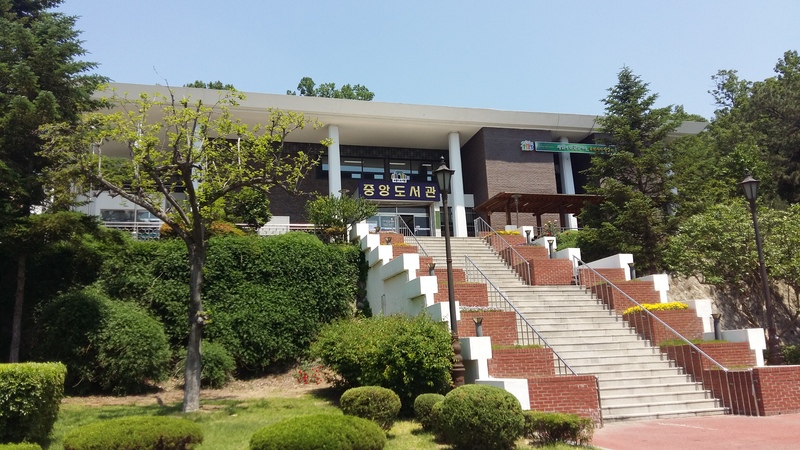 Interestingly, Moon has had quite a bit of trouble with the law both in South Korea and the United States where he spent 13 months in prison for tax evasion. 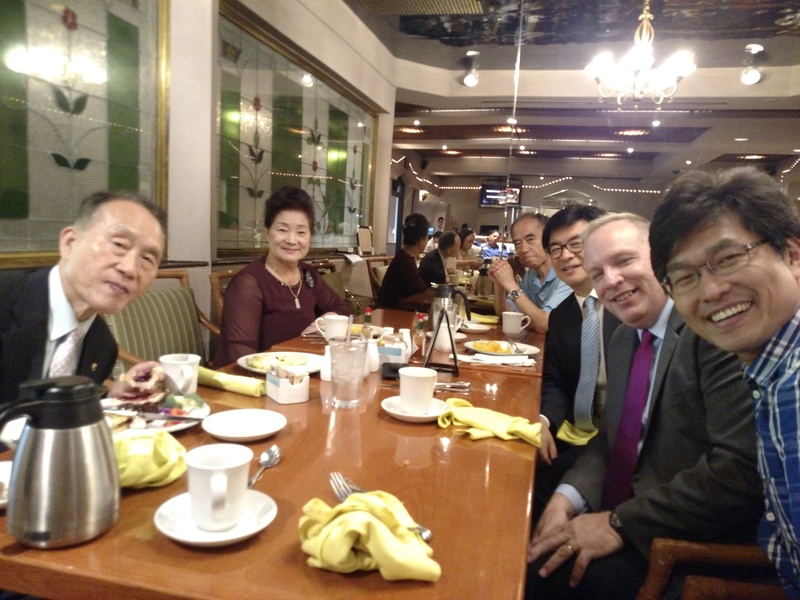 The Unification Church views the apostle Paul as the founder of Christianity, who codified the teachings of Jesus into a formal religion. Hell is accepted as being present on Earth now, but in time will become Heaven on Earth. They also view Communism as an expression of Satan and link it with Cain, while viewing Democracy as the expression of God and link it with Abel. They also believe that Eve had a sexual affair with Lucifer which caused the spiritual fall of humankind. Before she was married to Adam, she also had premarital sexual relations with him, causing the physical fall of humankind. Their marriage produced an imperfect family allowing Satan to have control of the world. The remedy to this problem was for Jesus (the 2nd “Adam”) to form the perfect marriage to redeem humankind, but he was crucified before he could complete his mission. 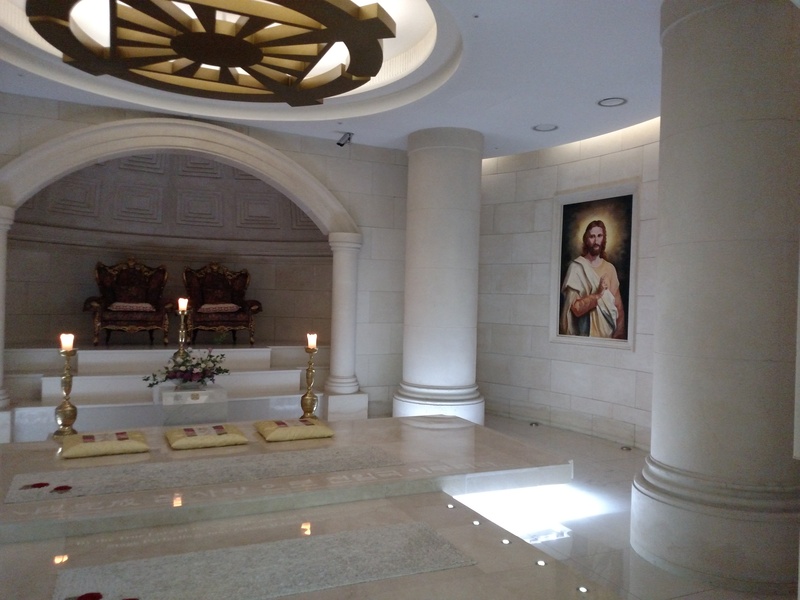 His spiritual resurrection did secure spiritual salvation for humankind, but because Jesus wasn’t able to complete his mission, physical salvation is not possible in this lifetime. Therefore, a third “Adam” is needed to provide complete salvation for humankind. 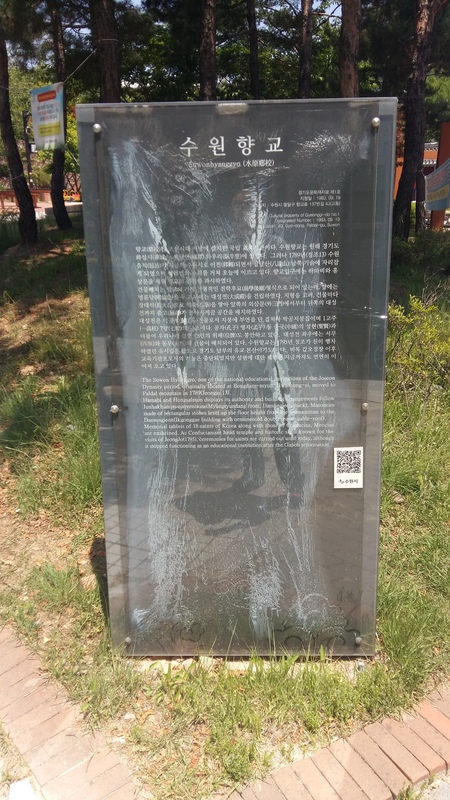 According to the Resurrection Church, this 3rd Adam was born in Korea between 1917 and 1930 and his appearance will be recognized as the 2nd coming of Christ. This 3rd Adam will marry, producing the perfect family, enabling complete salvation for those who choose it. Many Unificationists had viewed Rev. 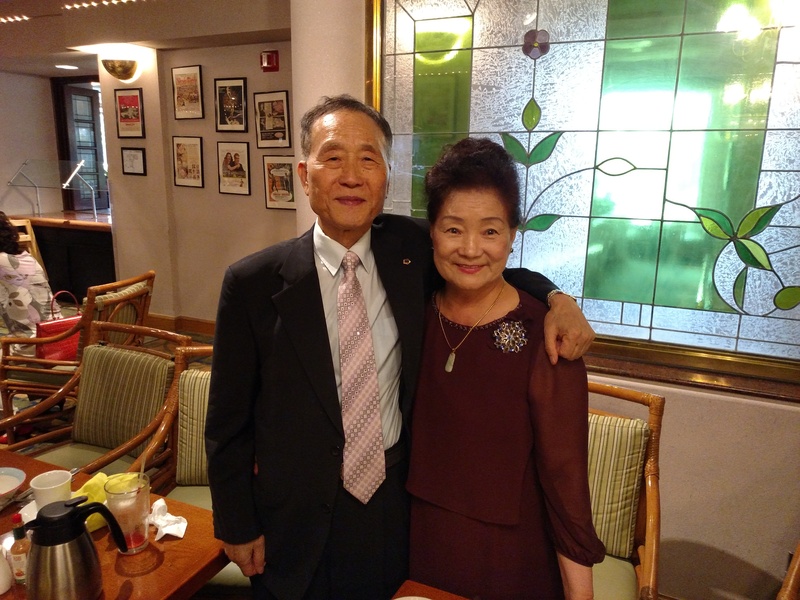 Moon and his wife Hak Ja Han (his 2nd) as this perfect family, the “true spiritual parents of humankind” but he died in 2012, having appointed his youngest son, Hyung Jin Moon, his successor in 2008. 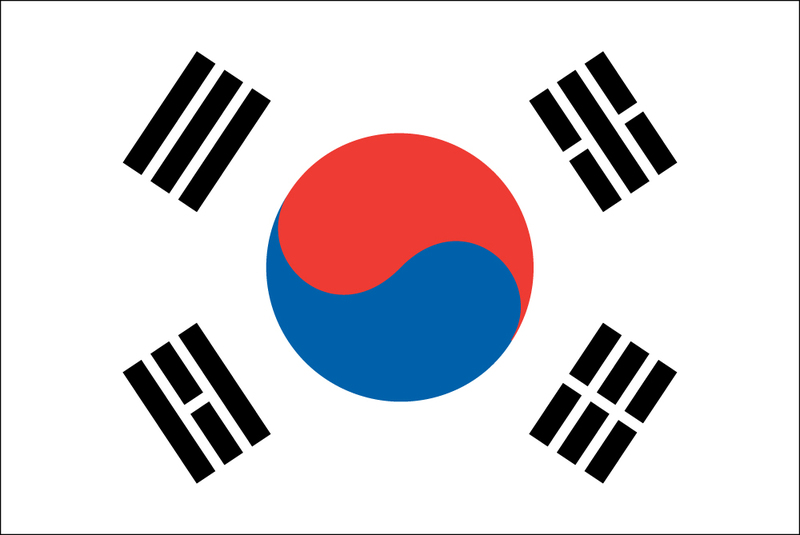 The Unification Church is known for their mass weddings. Many times, the couples do not know who they will marry until a month before the ceremony, sometimes not meeting them until that day. They can, however, not participate in the wedding without shame. 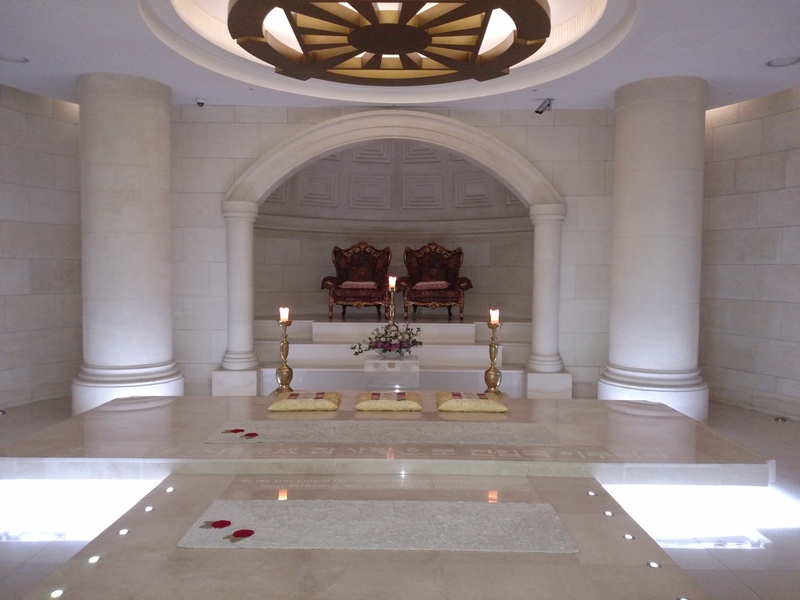 The newlyweds do not consumate their marriage for 40 days, representing the 40 days that Jesus spent in the wilderness. 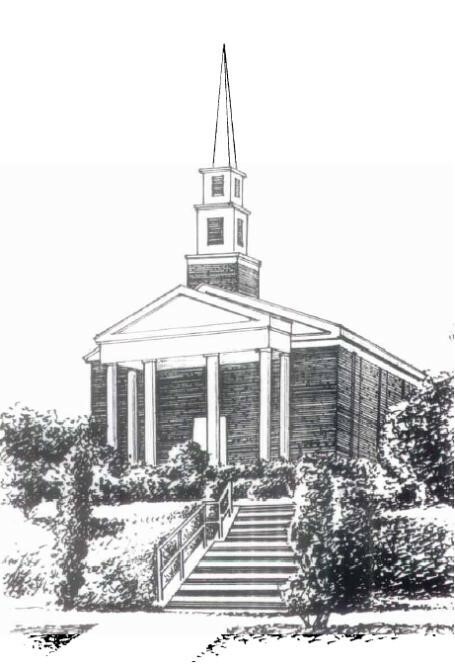 The church emphasizes the importance of the family and encourages times of family study and devotion. Exact membership numbers are hard to determine but are said to be in the hundreds of thousands worldwide, with about 5,000 in the U.S. 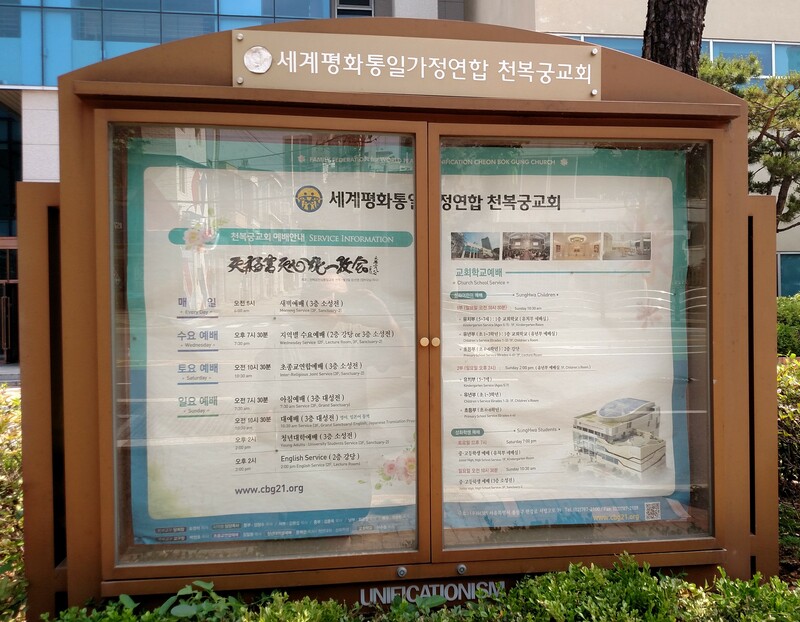 It appears that membership in South Korea is not significant enough to appear anywhere but in the “others” column of religious adherents. 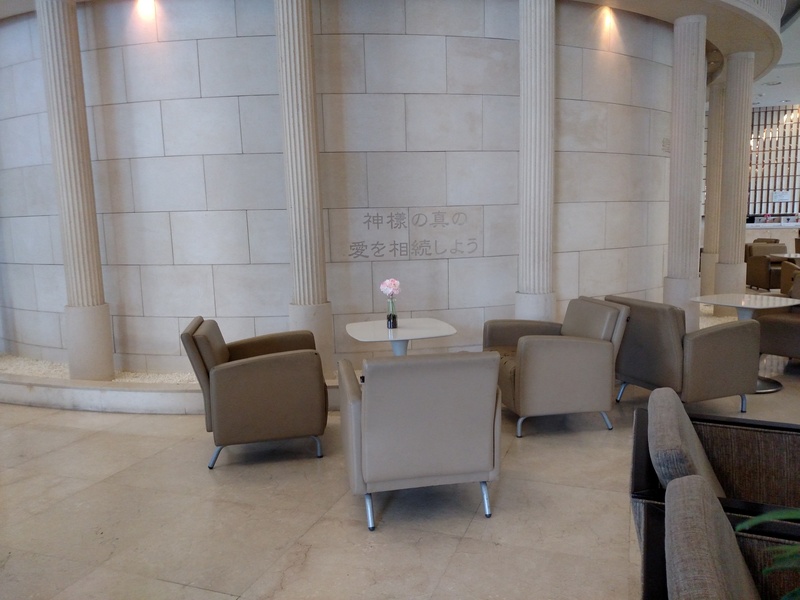 As you walk in the main entrance, your eyes are drawn to a round room in the center surrounded by blocks and pillars. 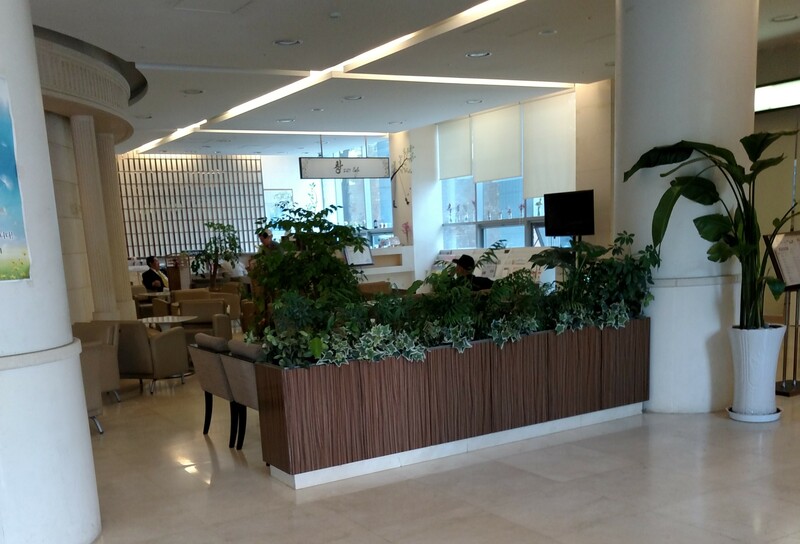 To the right is a small cafe. 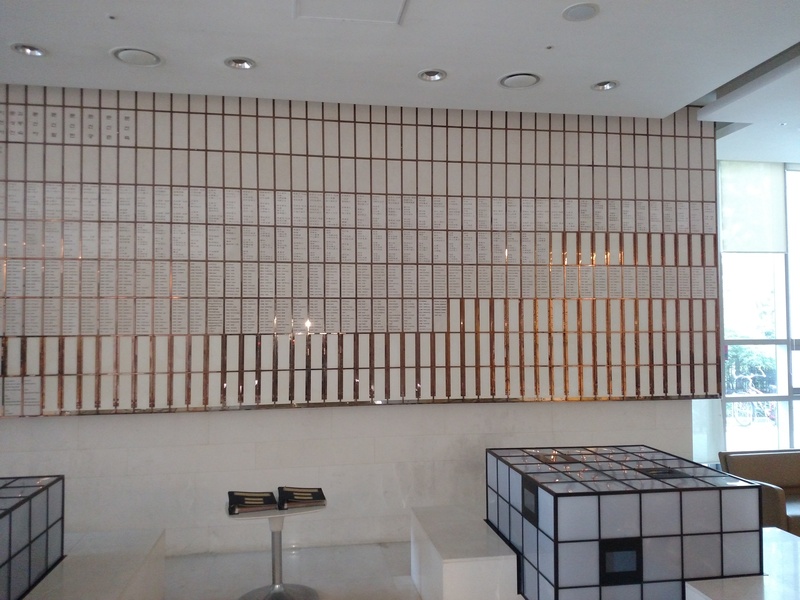 To the left and behind are a number of personalized tiles. 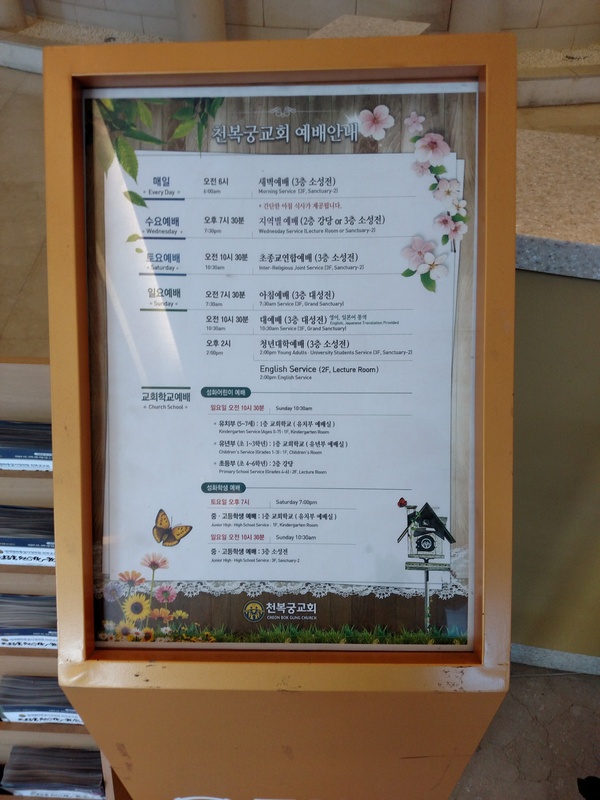 By the information desk at the entrance is a schedule of the services offered. 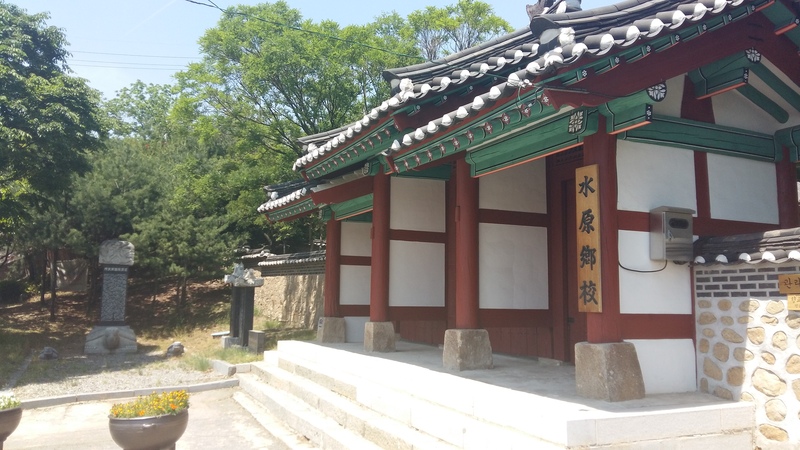 The round room in the center is the “Jeongseong Room.” According to the sign in front of it, this room is an area for offering prayer and jeongseong in silence. Before entering, pray-ers are to remove their shoes and be careful not to fall into the water, which doesn’t have a cover. 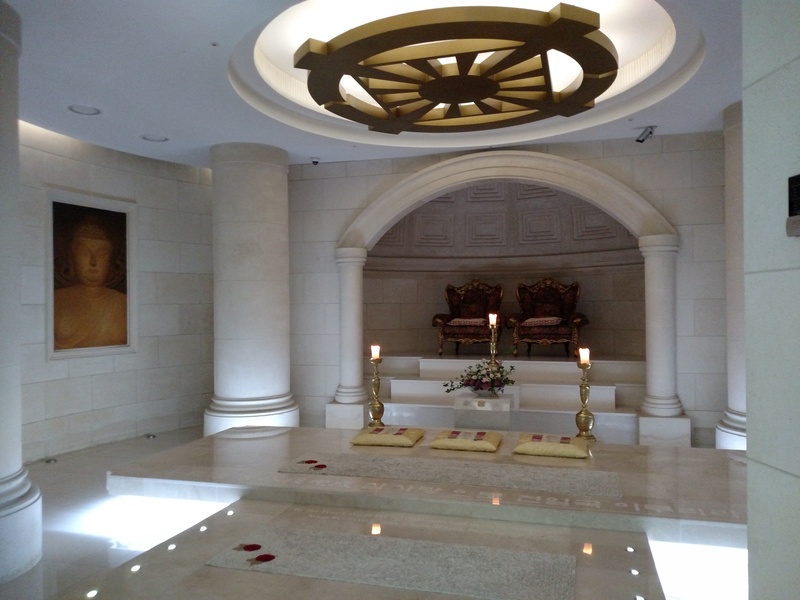 On the left side of the Jeongseong Room is a picture of Buddha. 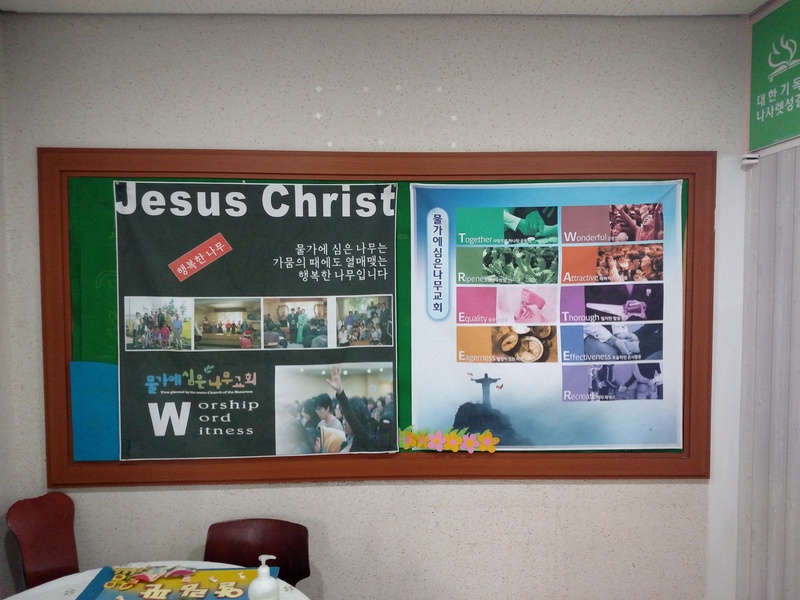 On the right side of the Jeongseong Room is a picture of Jesus. 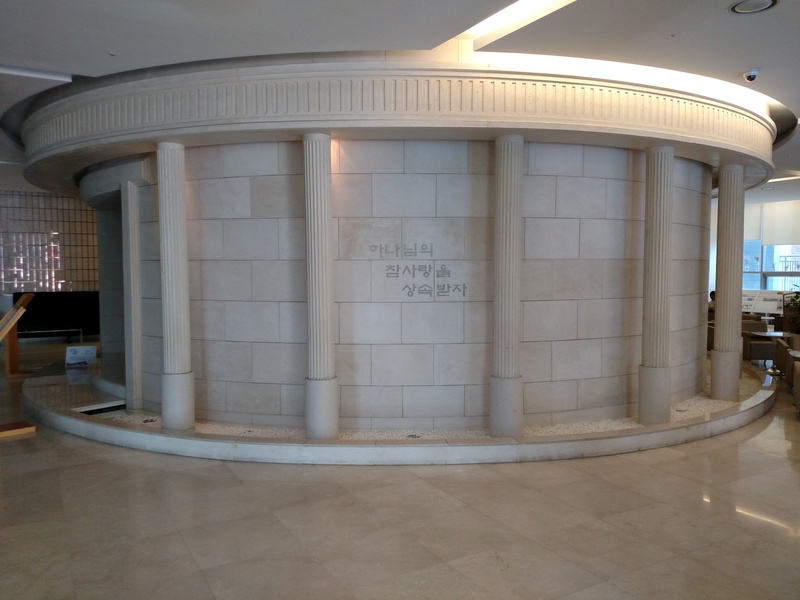 The Cheon Bok Gung Church is housed in a large building with space for worship, prayer. 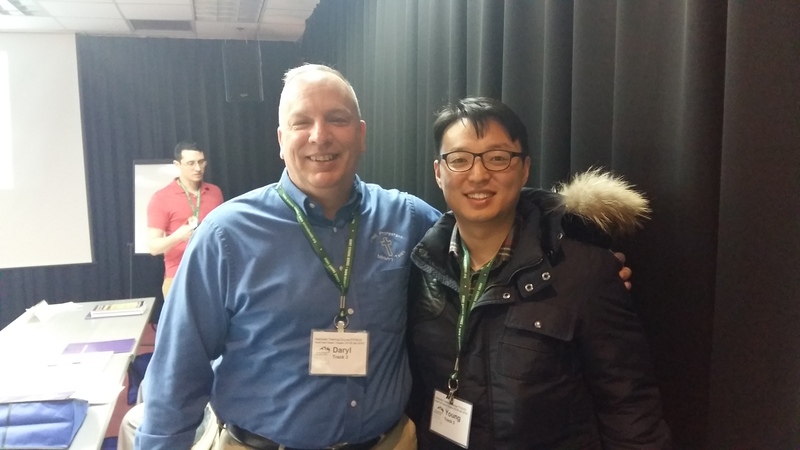 lectures, conferences and education.